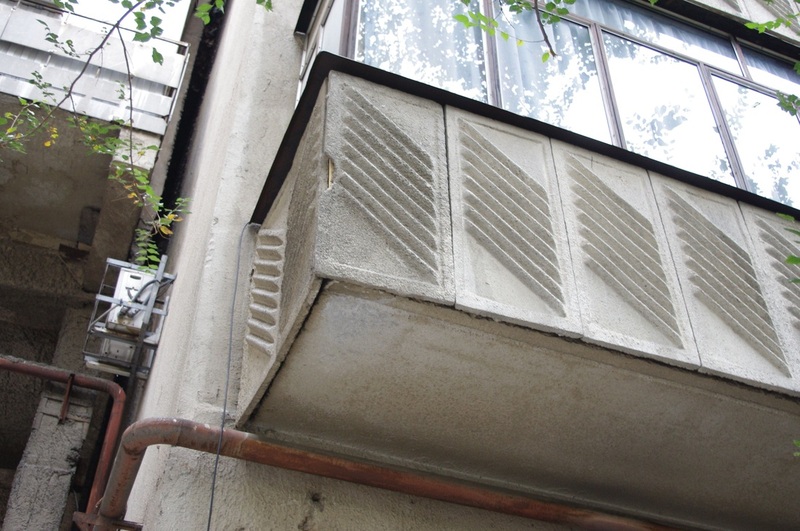 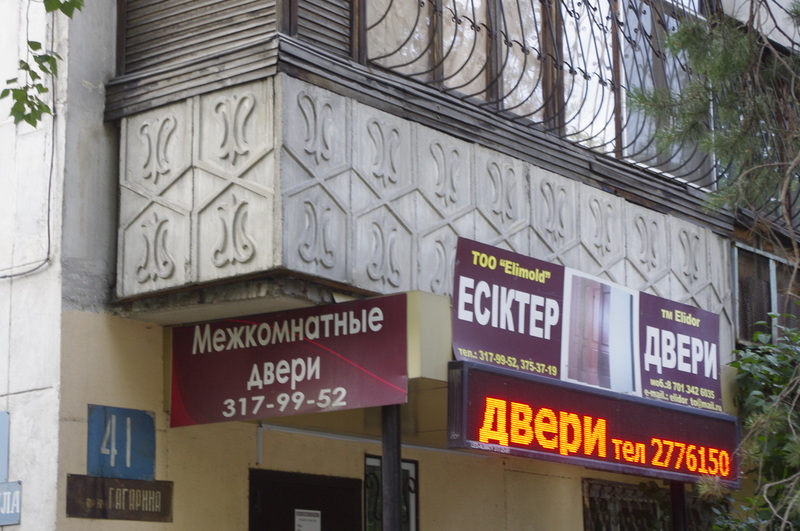 The Soviet apartment blocks of Almaty are boxy, no doubt, but they it's not like every building is totally slick and featureless like a fridge. 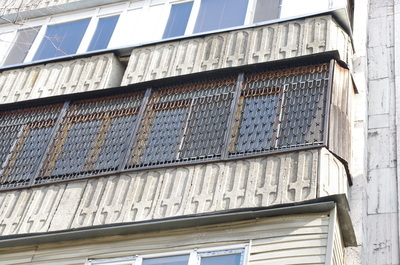 They're clad with orderly rows of balconies, hanging on the sides of every building. 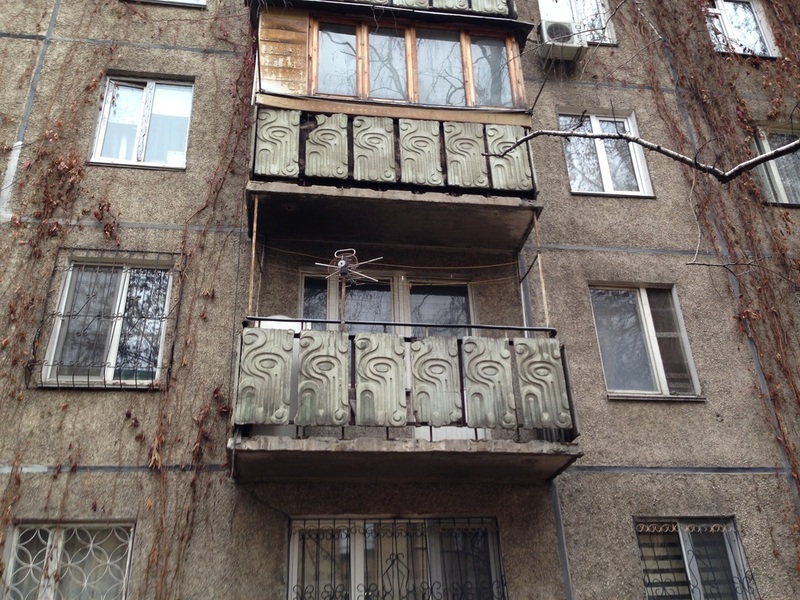 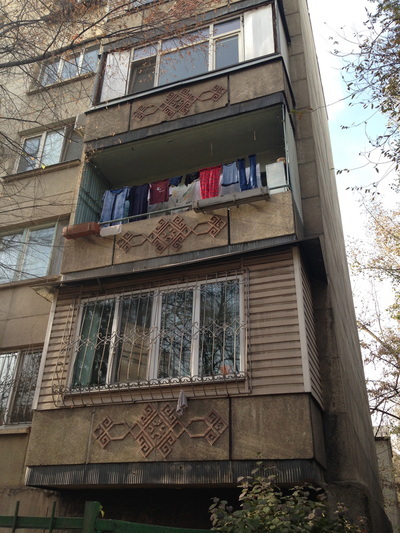 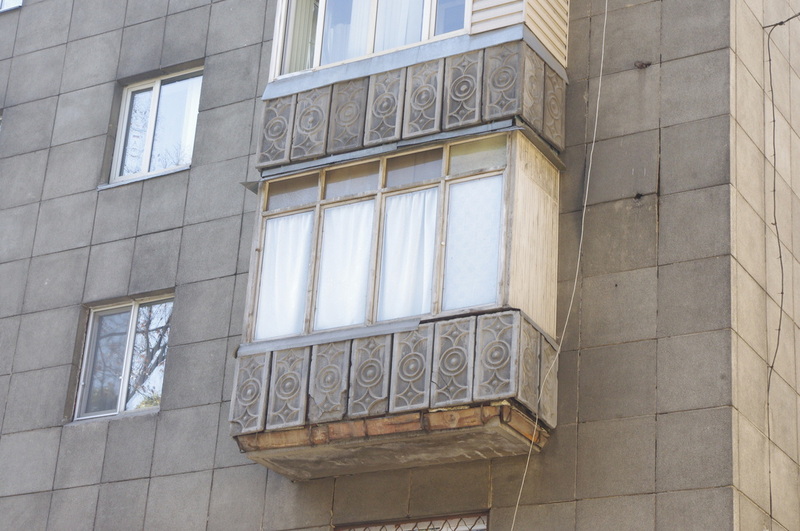 Most of these balconies, to be accurate, are no longer even balconies. 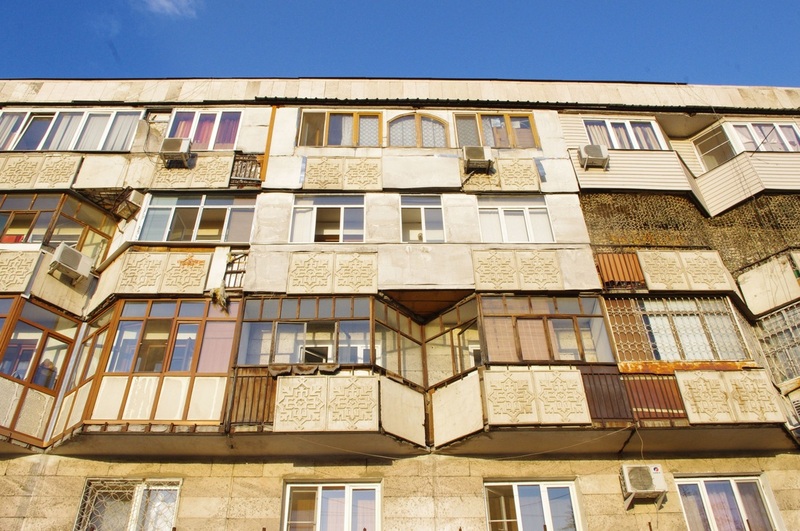 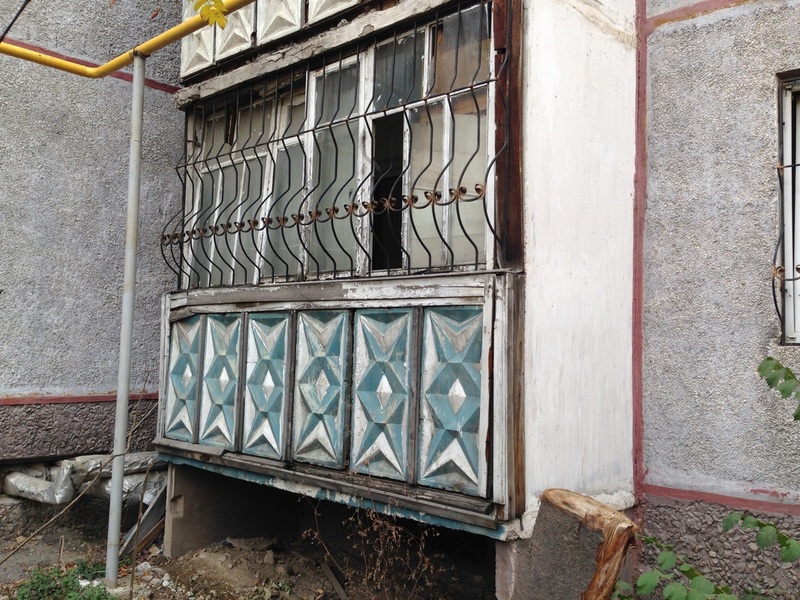 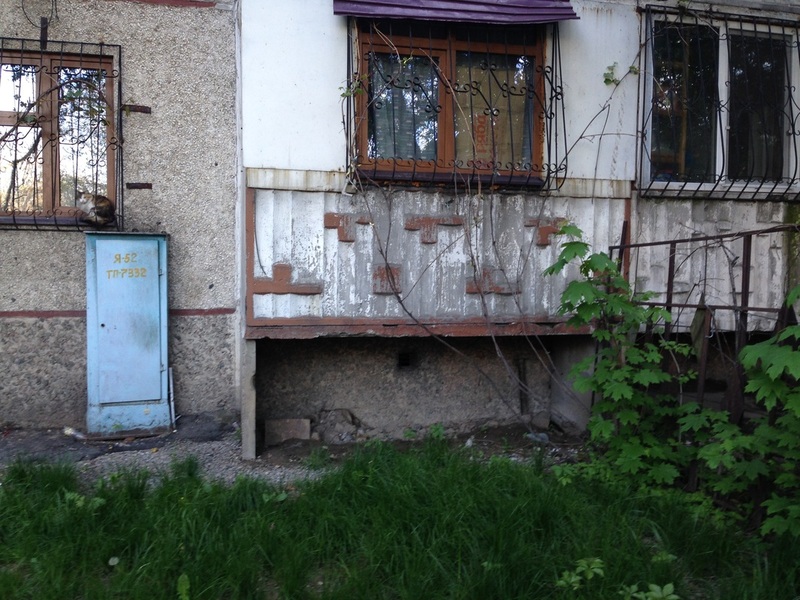 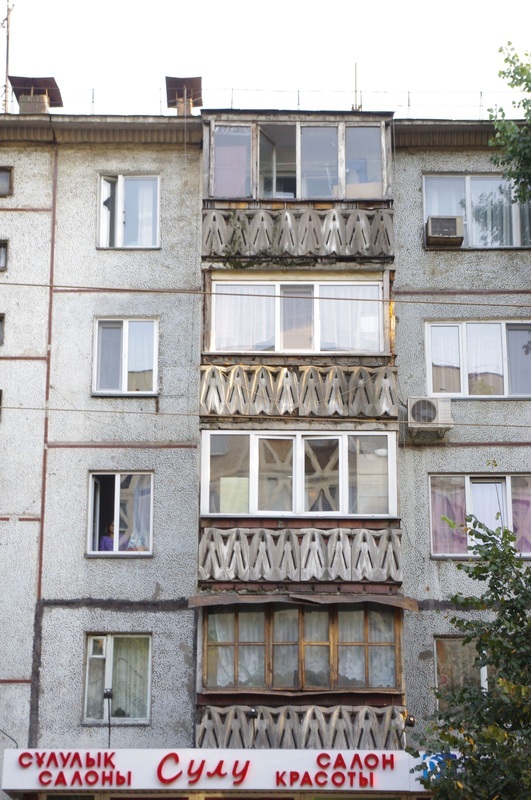 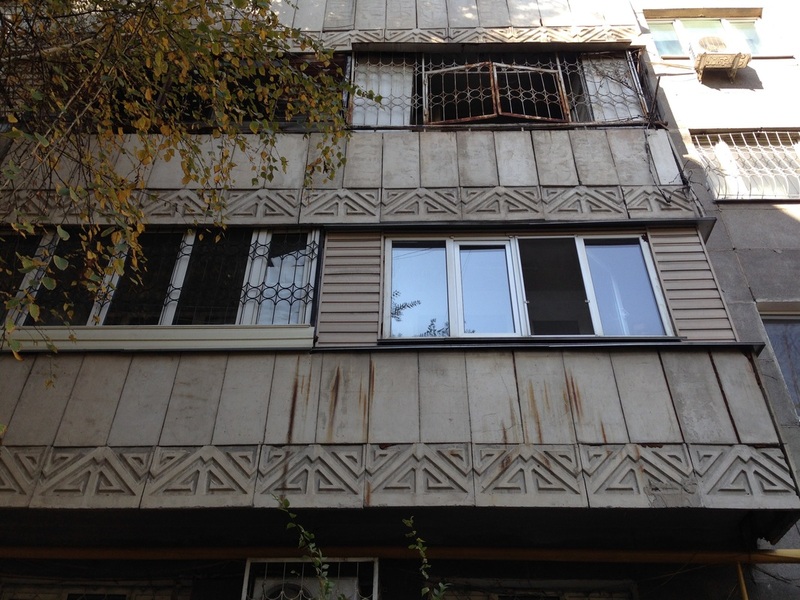 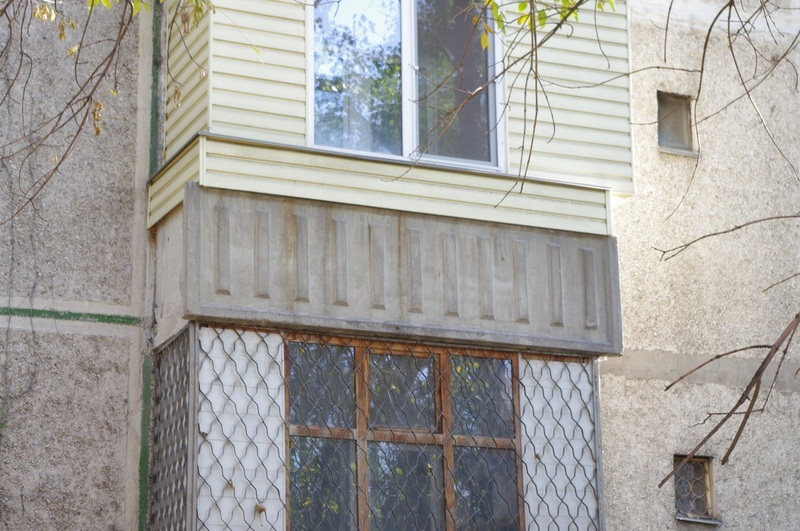 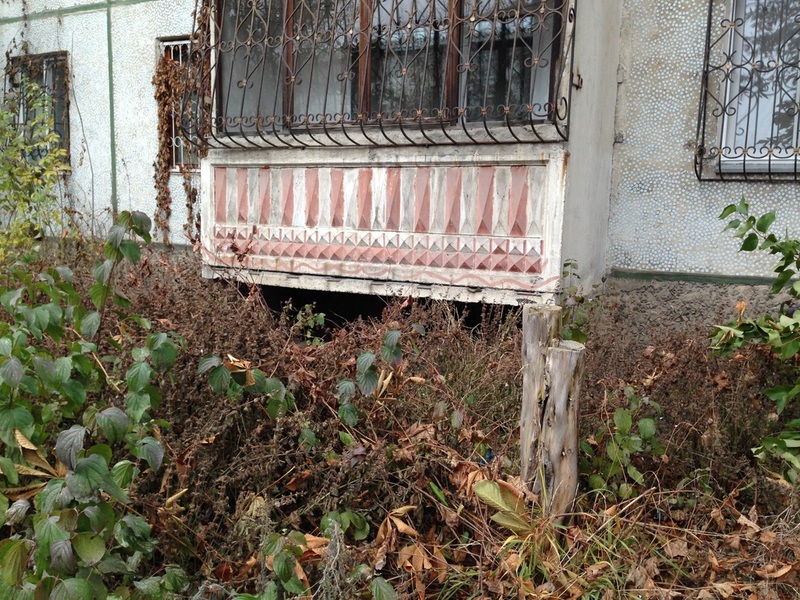 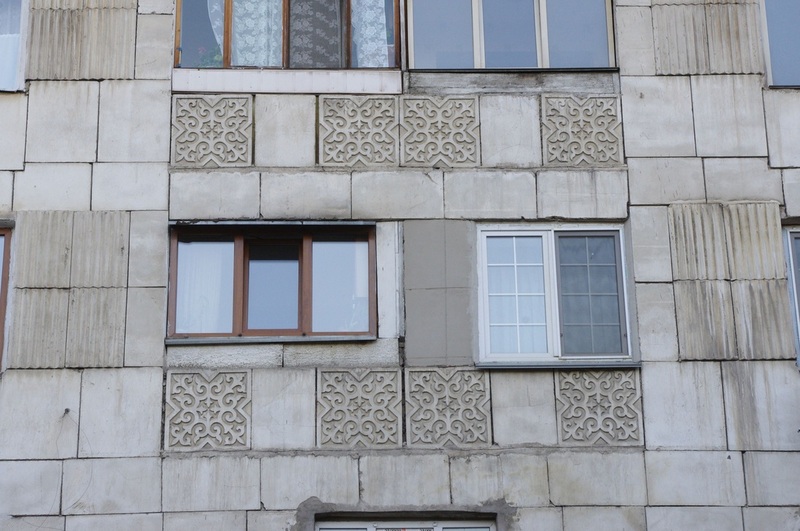 They've been remodeled since their Soviet days, enclosed by walls and windows to add square footage and storage space to cramped apartments. What do you call an enclosed balcony? You call it a lodzhiya [лоджия], that's what (the word's descended from the Italian architectural term loggia, in case you were wondering). 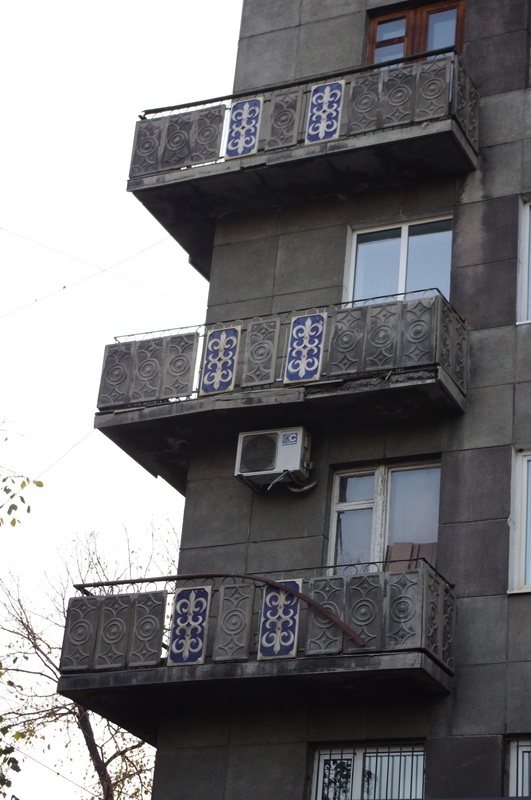 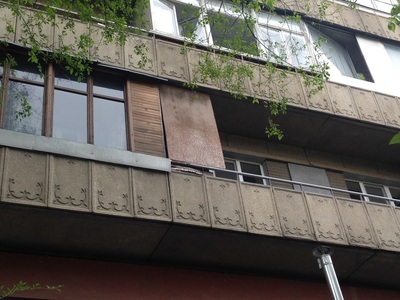 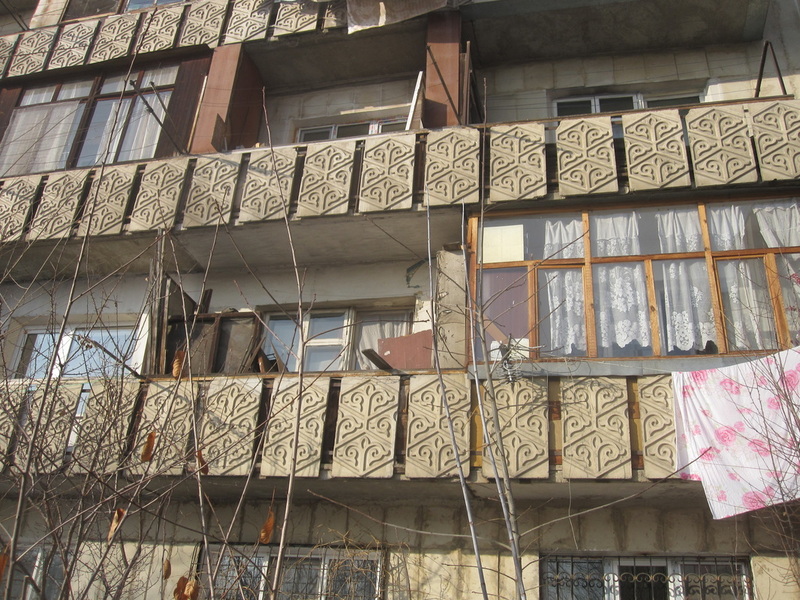 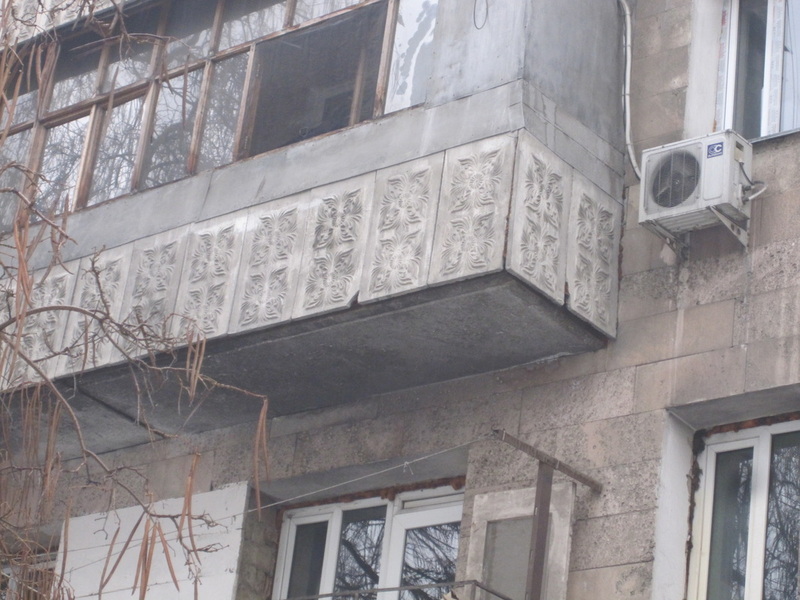 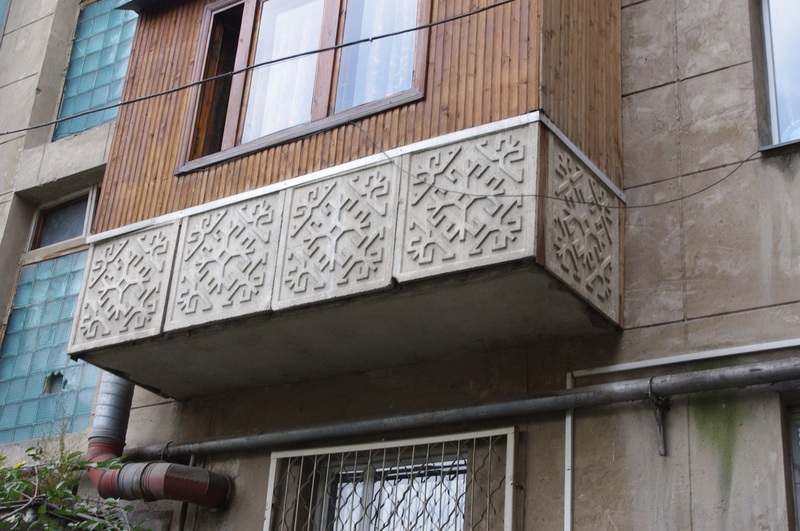 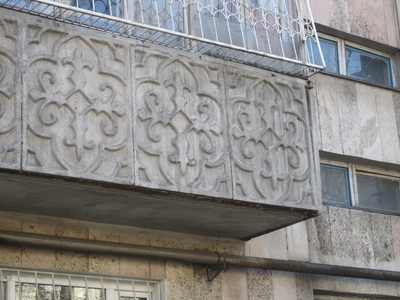 But they were meant to be balconies, so that's what we'll call them, and on the outside of every balcony are ornamental panels made from cement, lined up like piano keys. 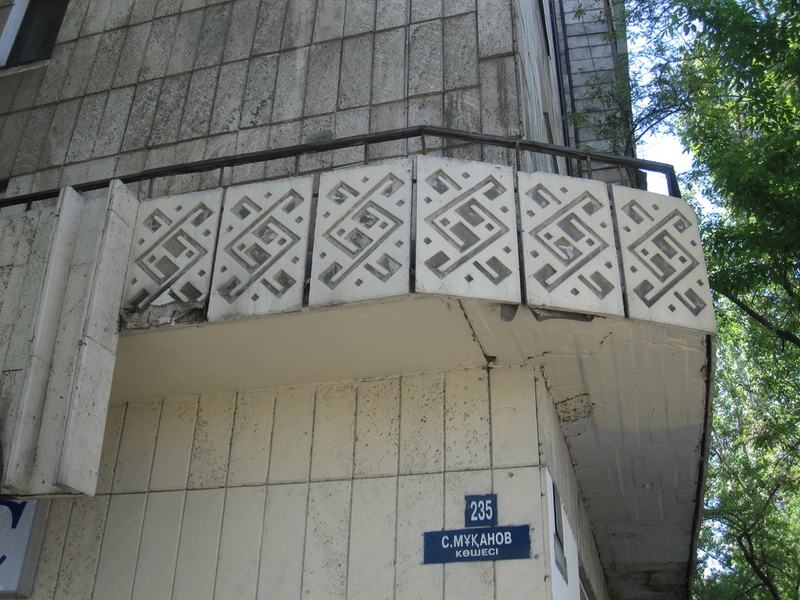 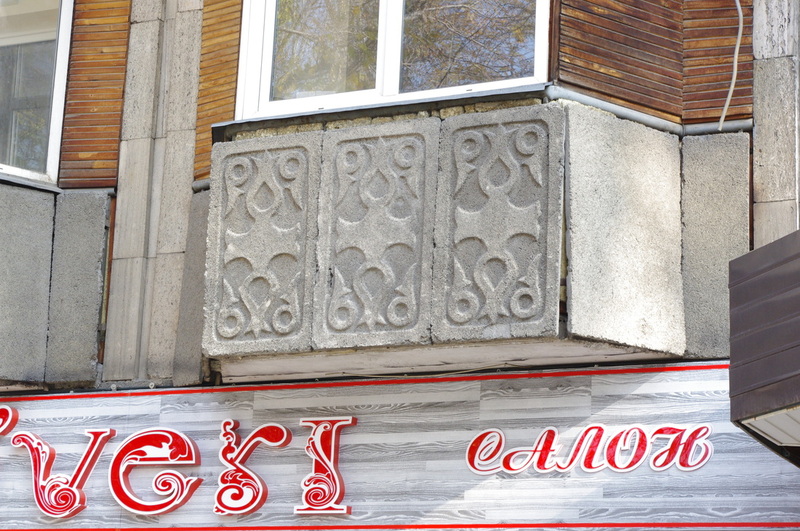 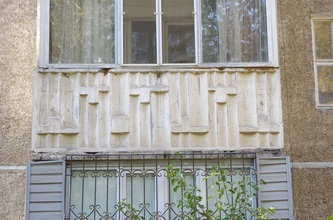 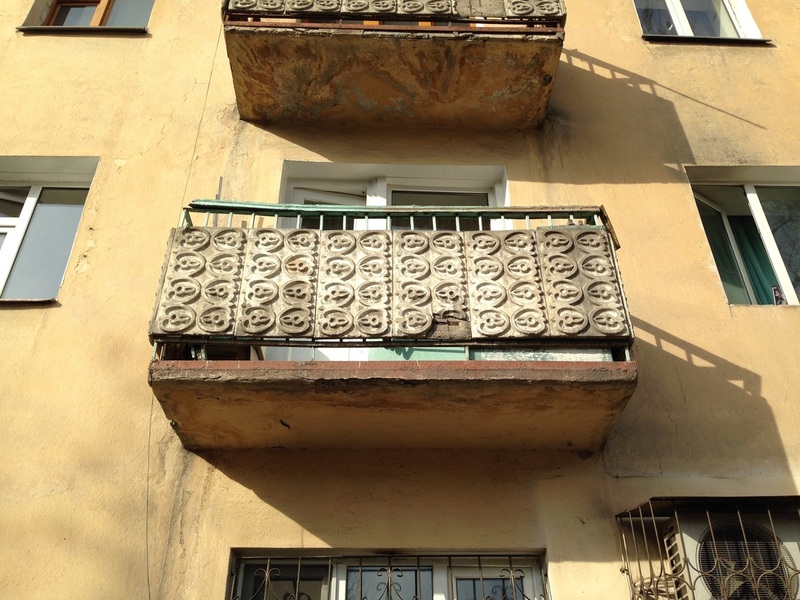 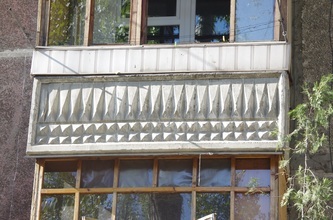 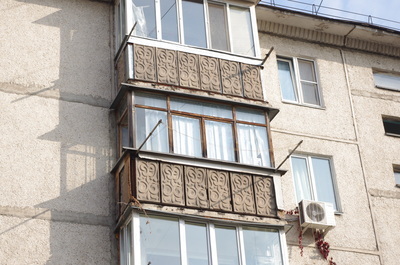 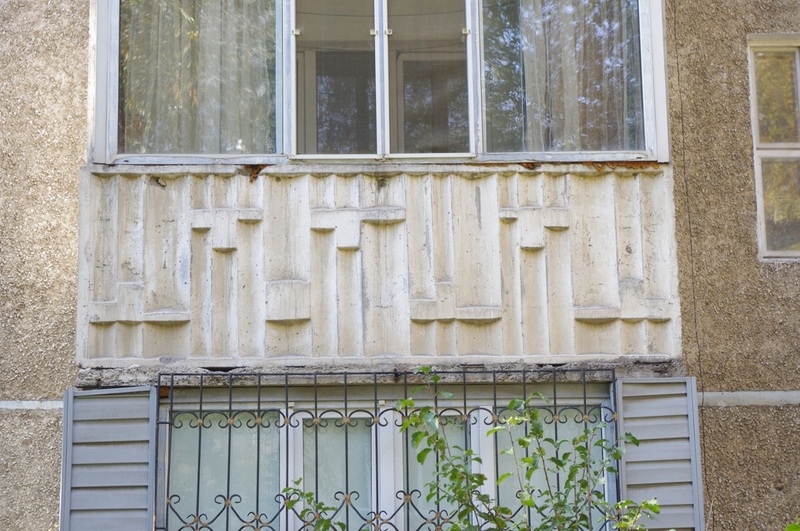 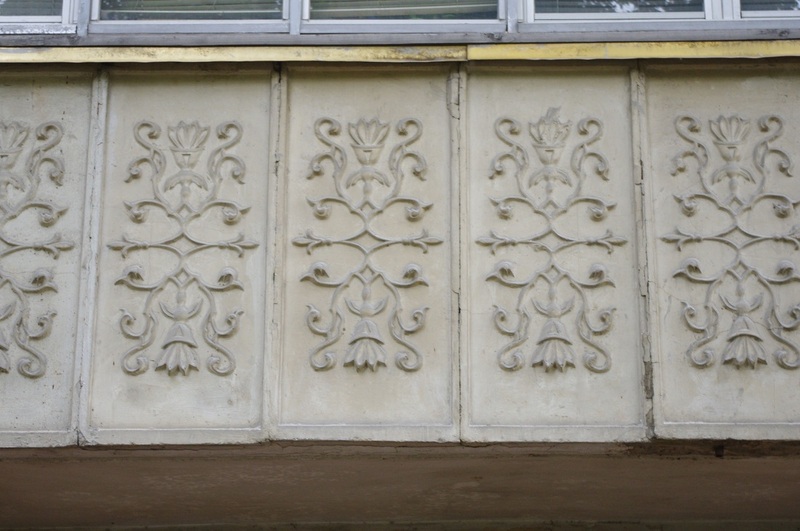 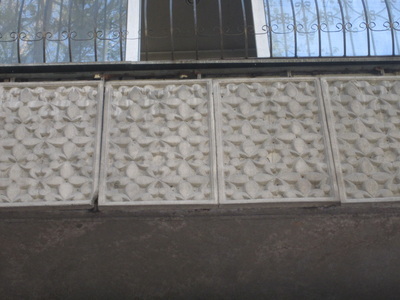 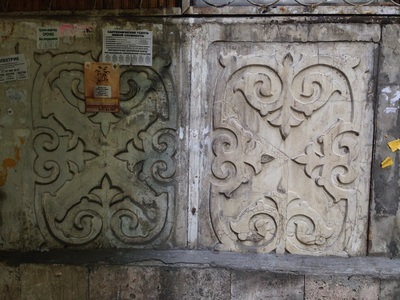 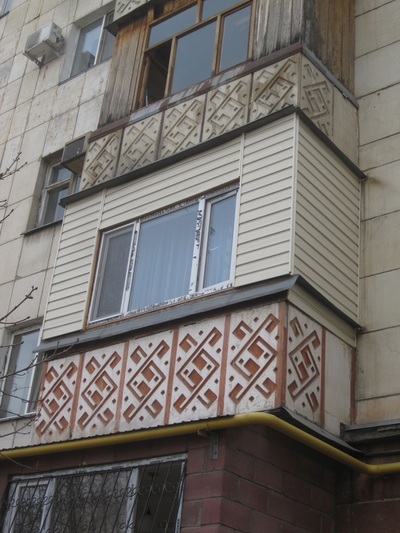 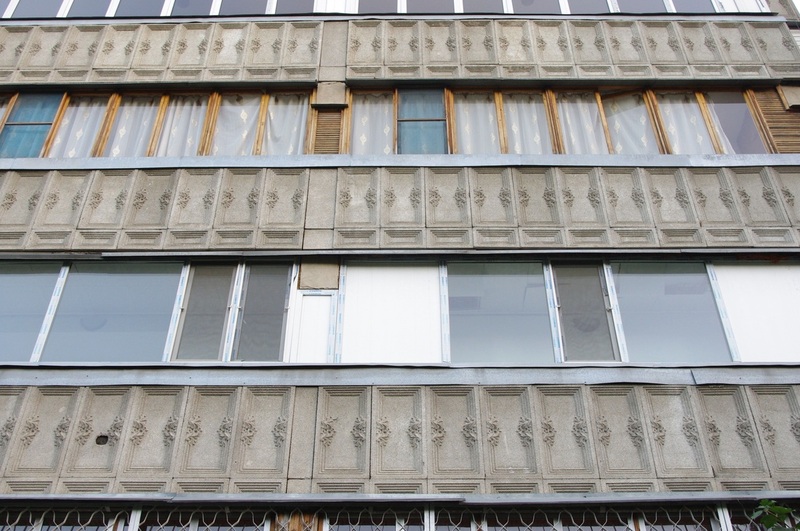 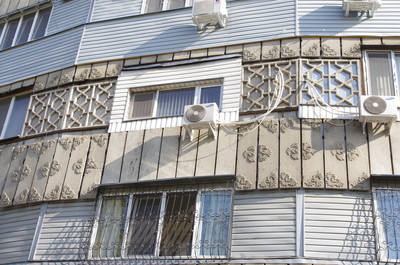 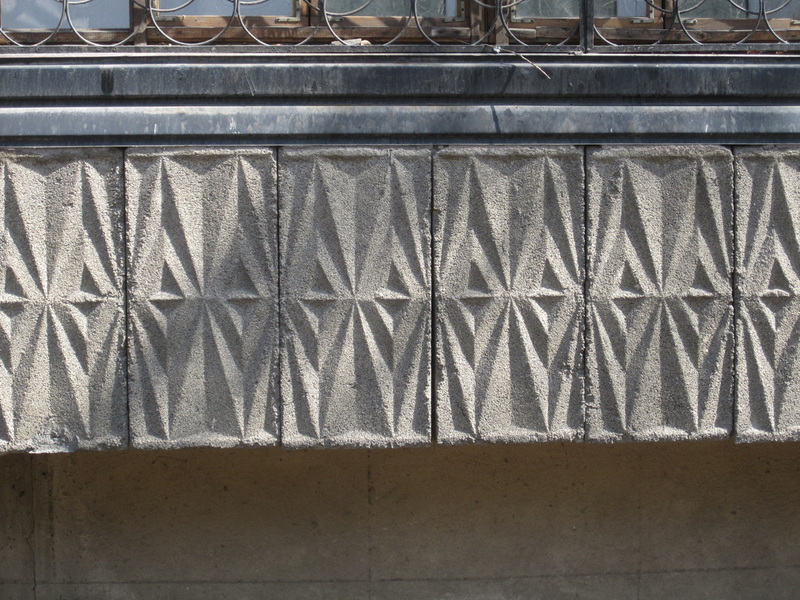 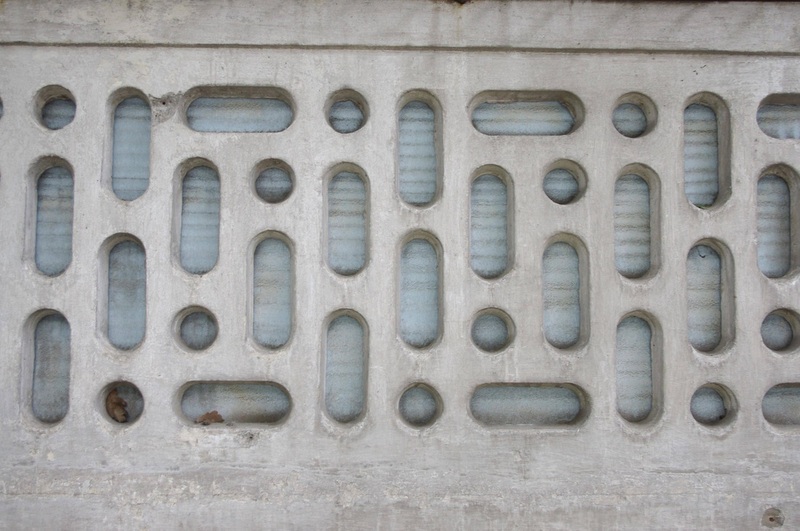 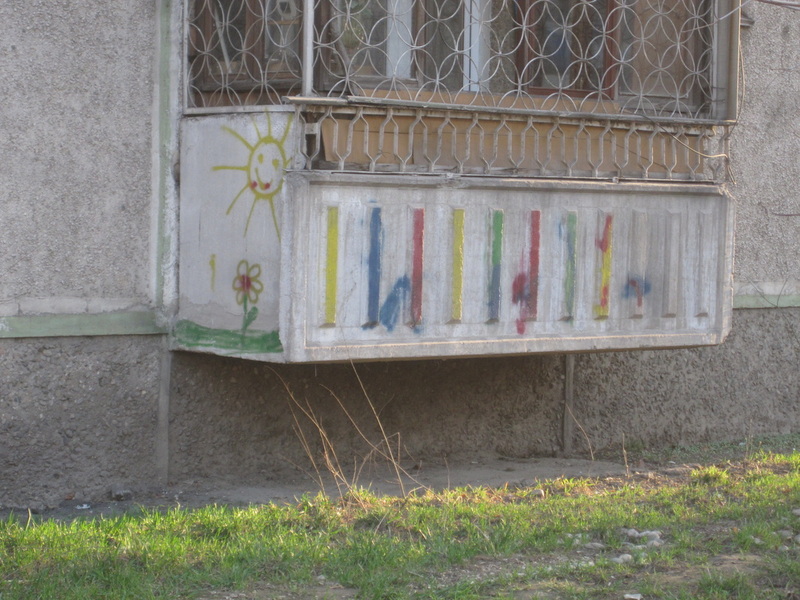 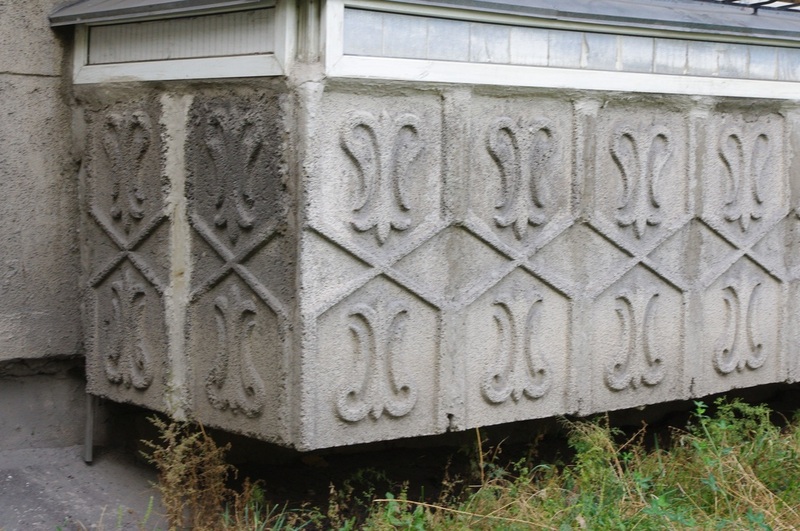 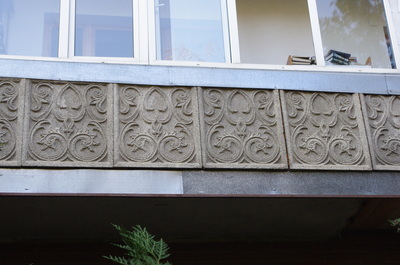 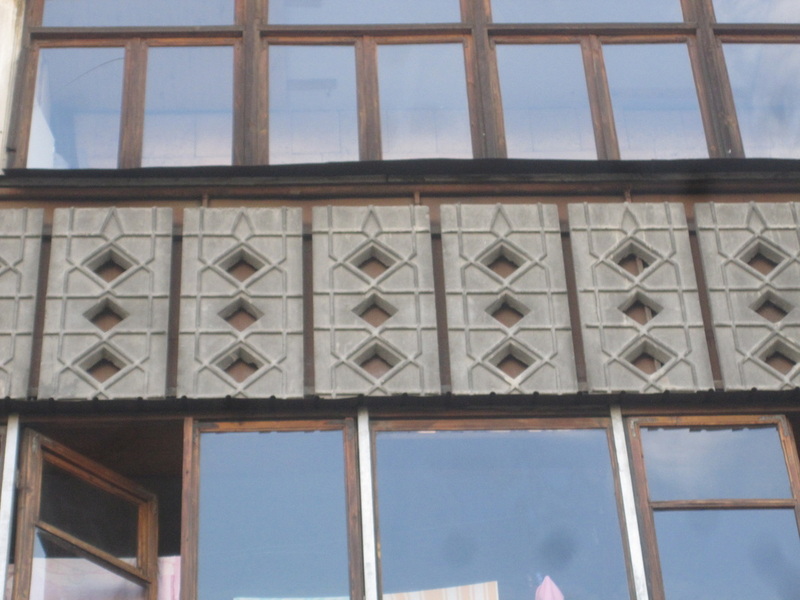 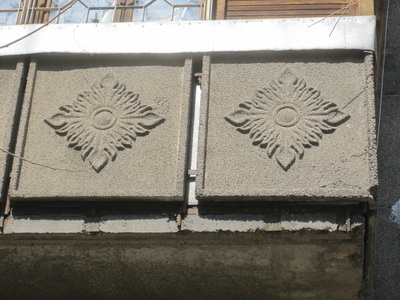 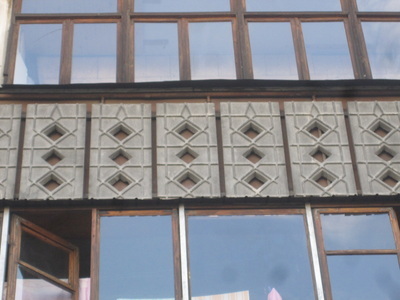 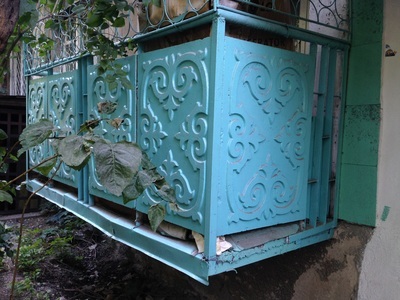 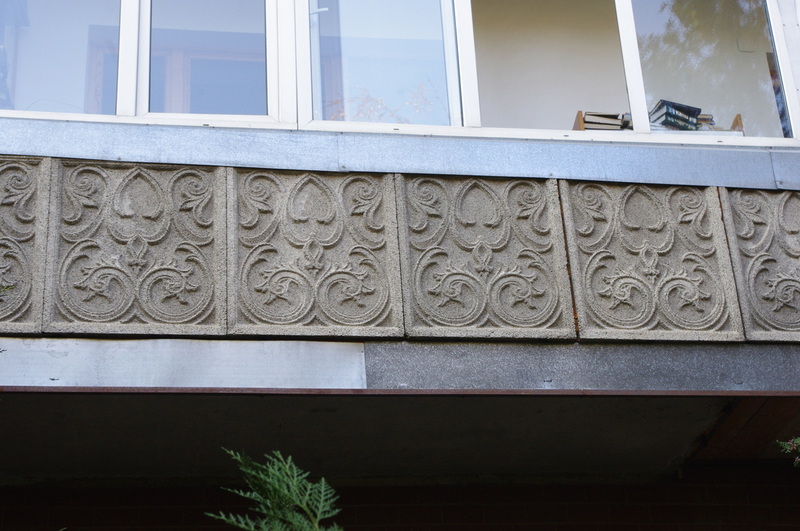 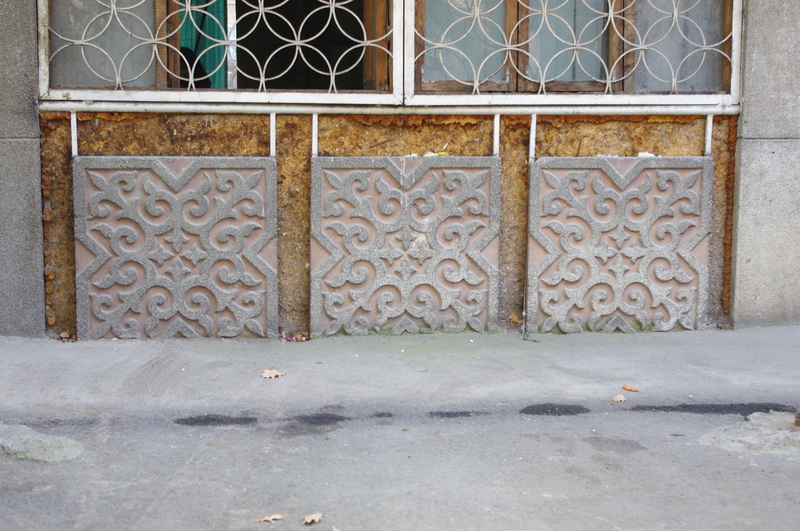 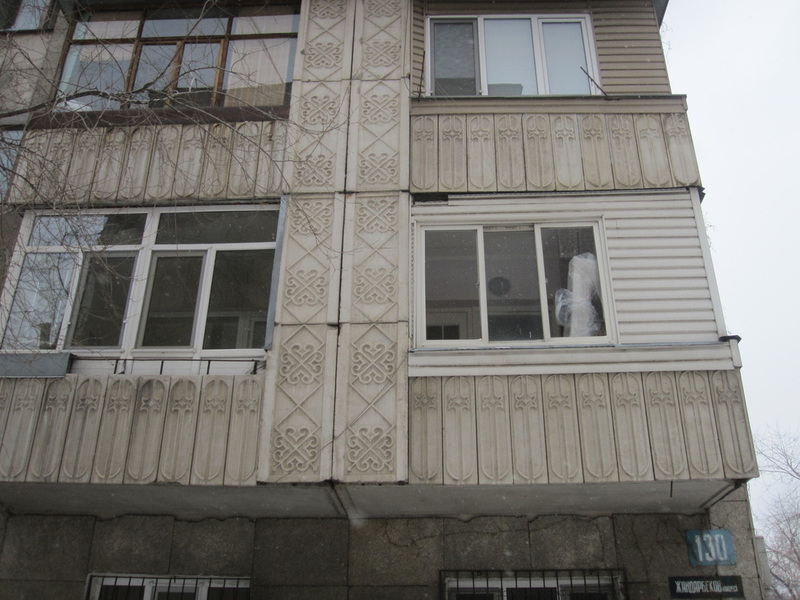 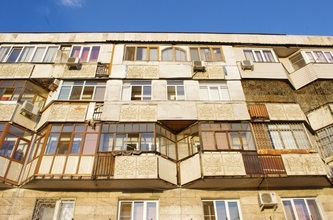 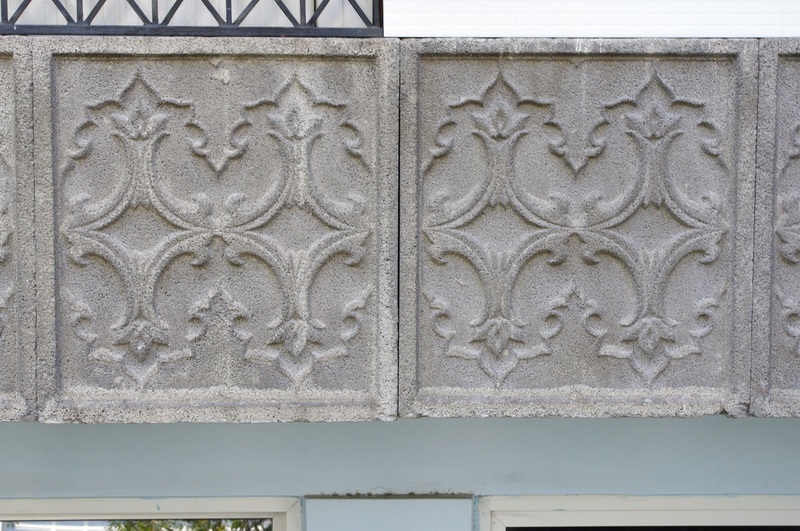 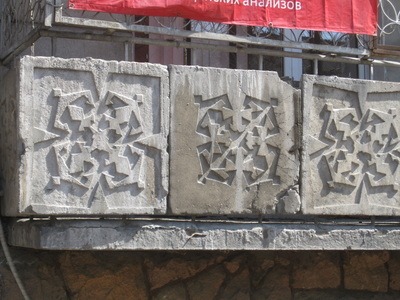 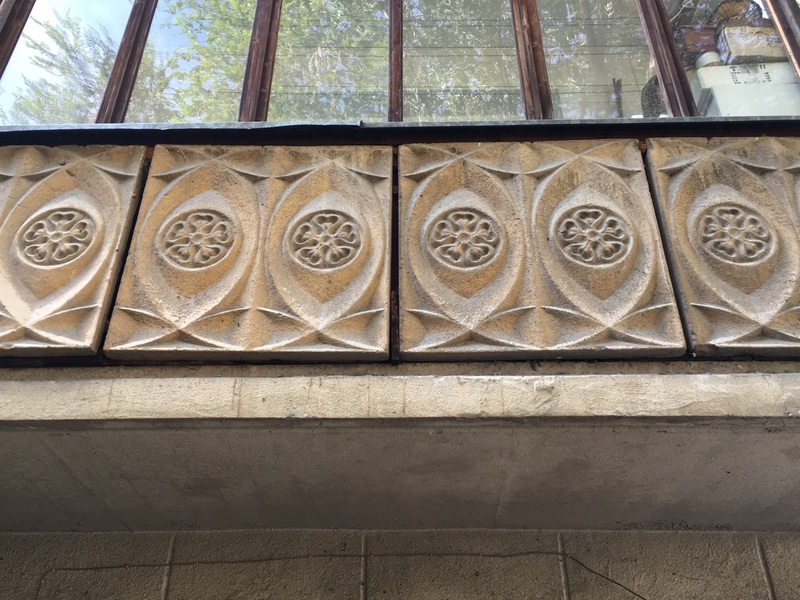 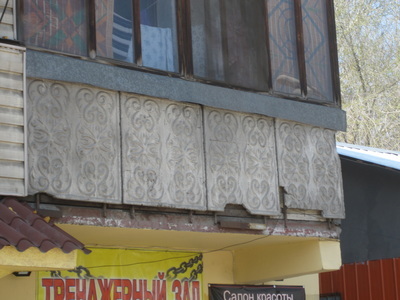 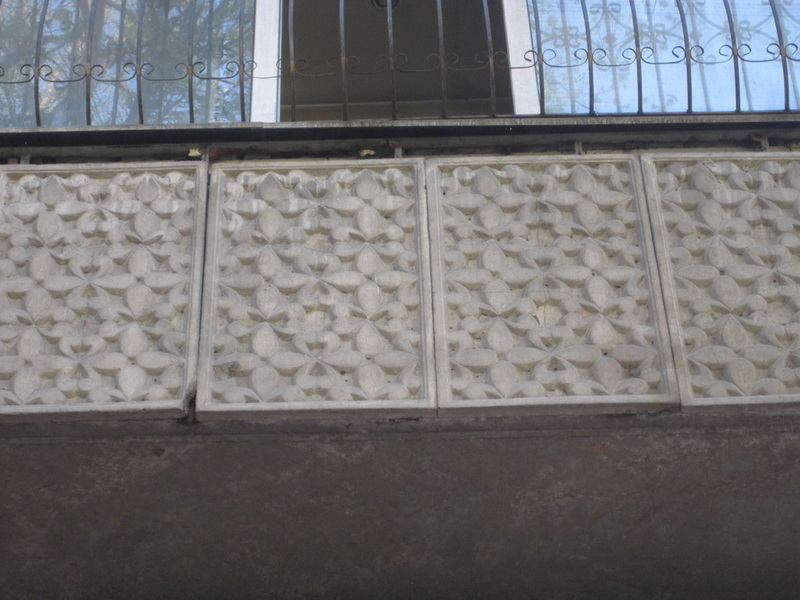 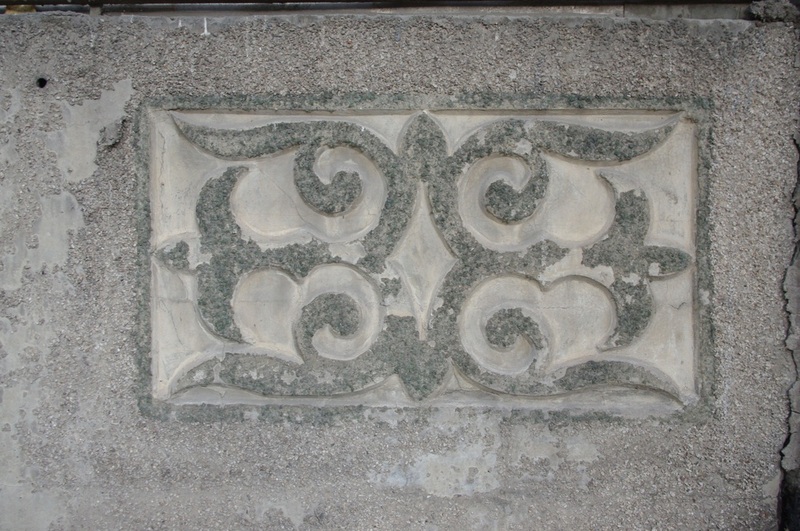 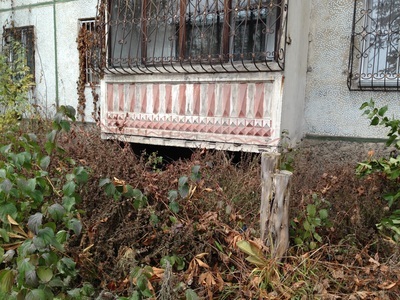 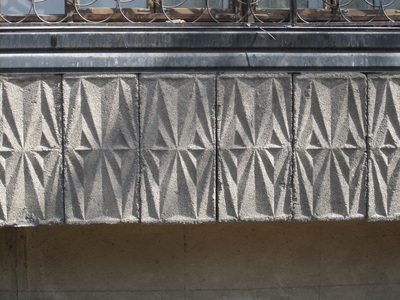 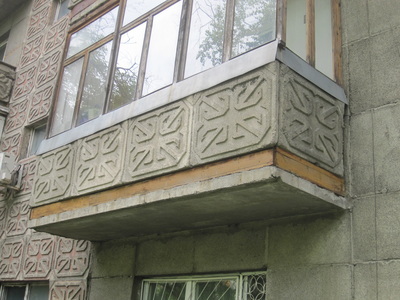 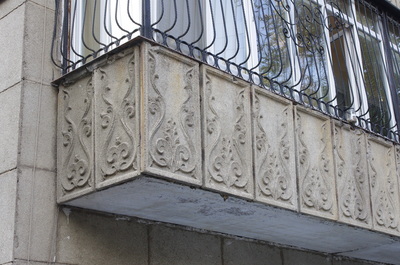 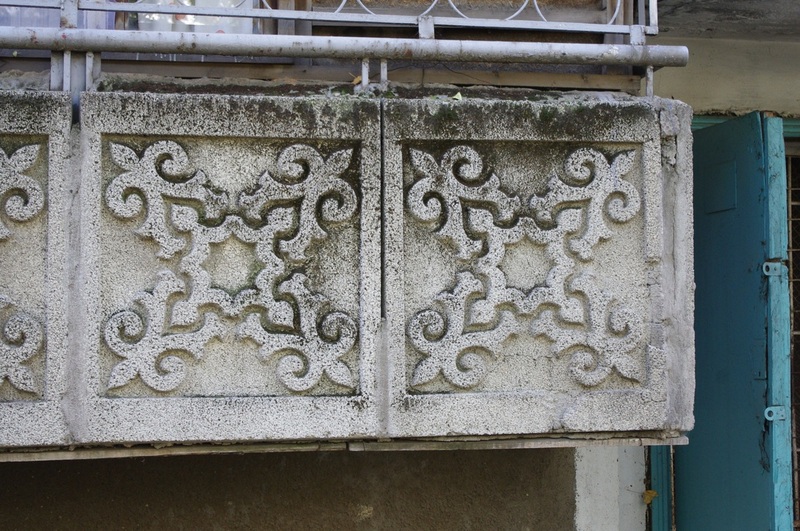 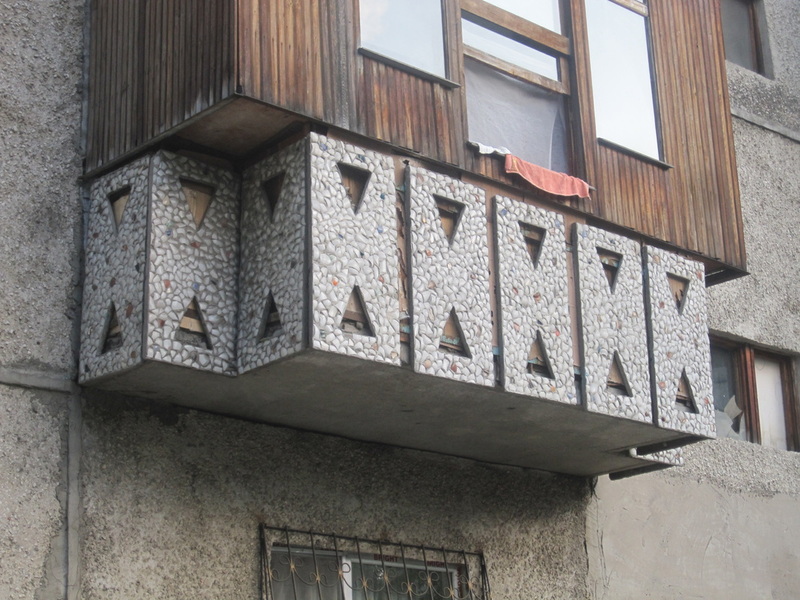 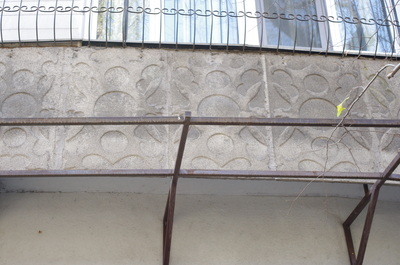 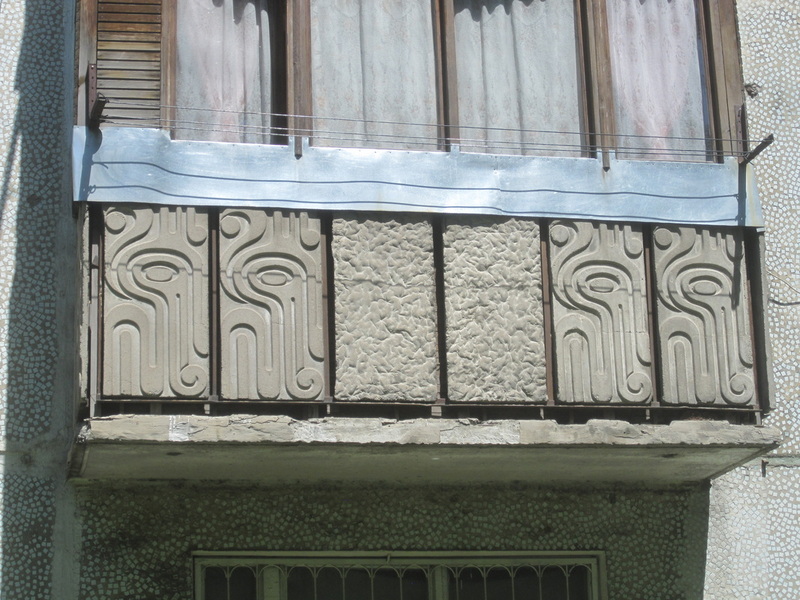 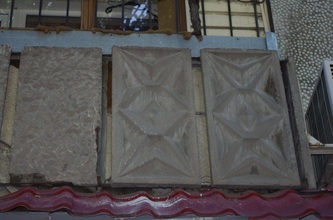 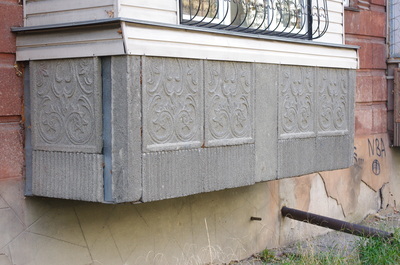 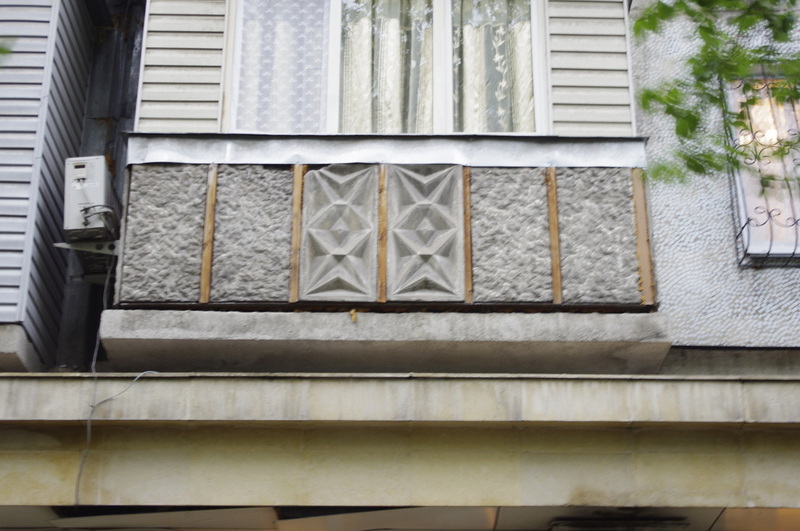 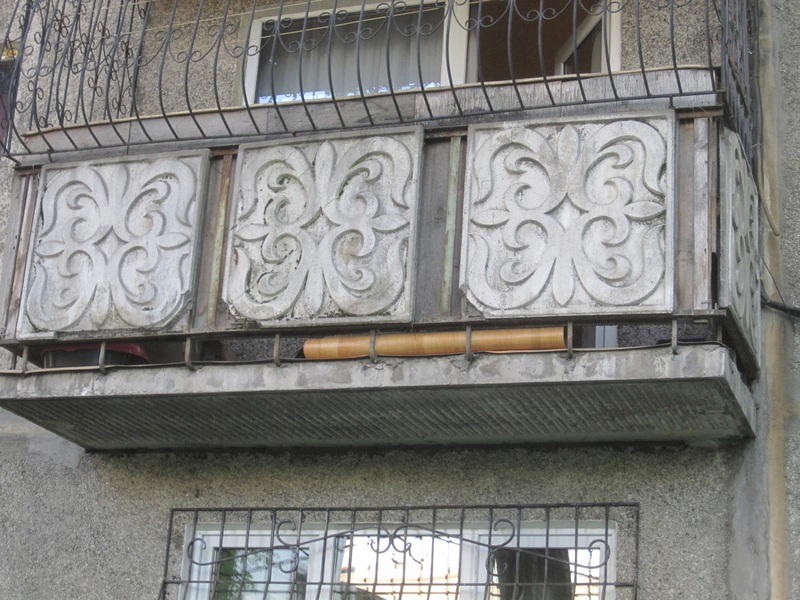 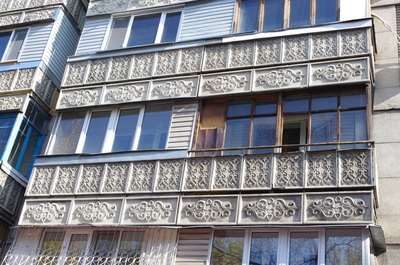 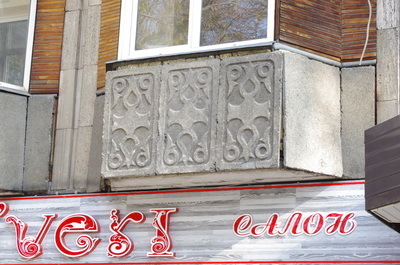 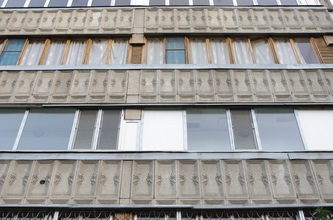 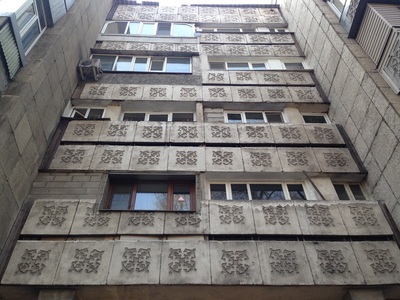 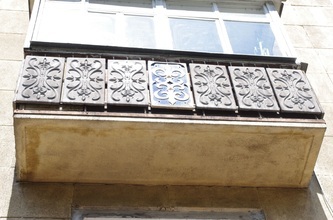 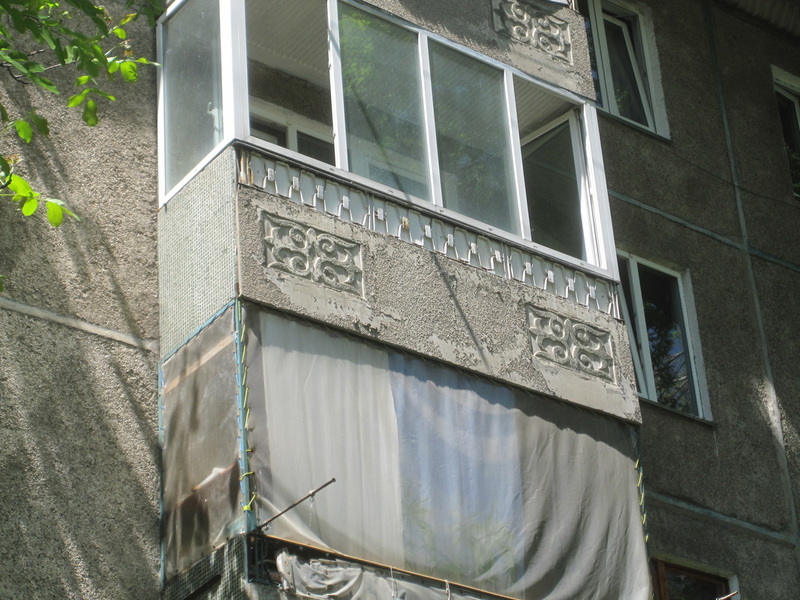 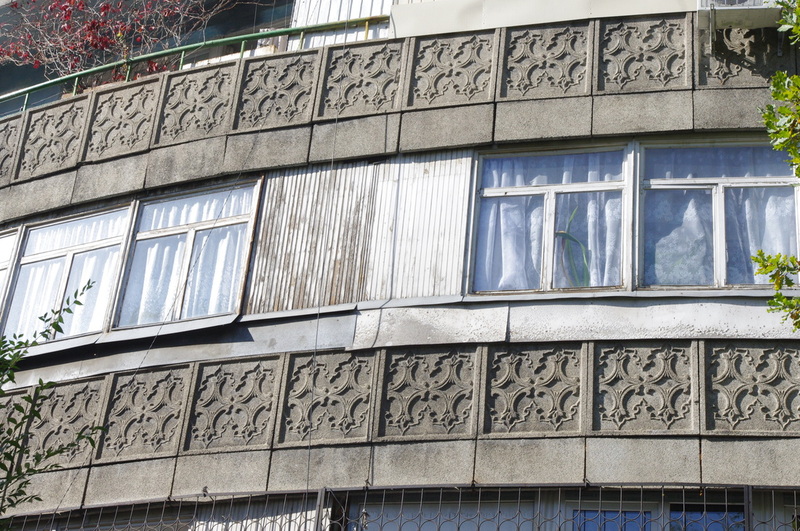 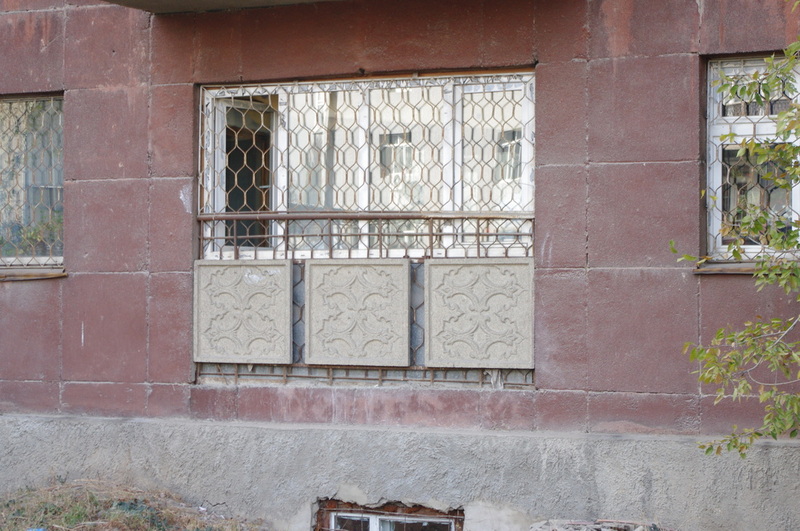 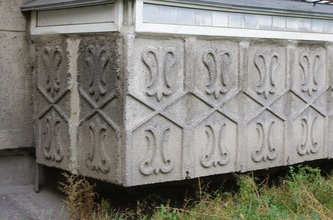 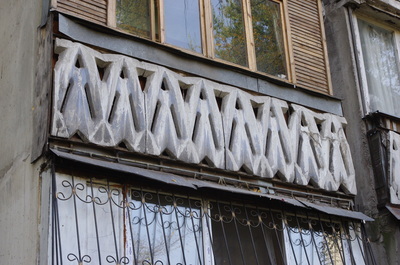 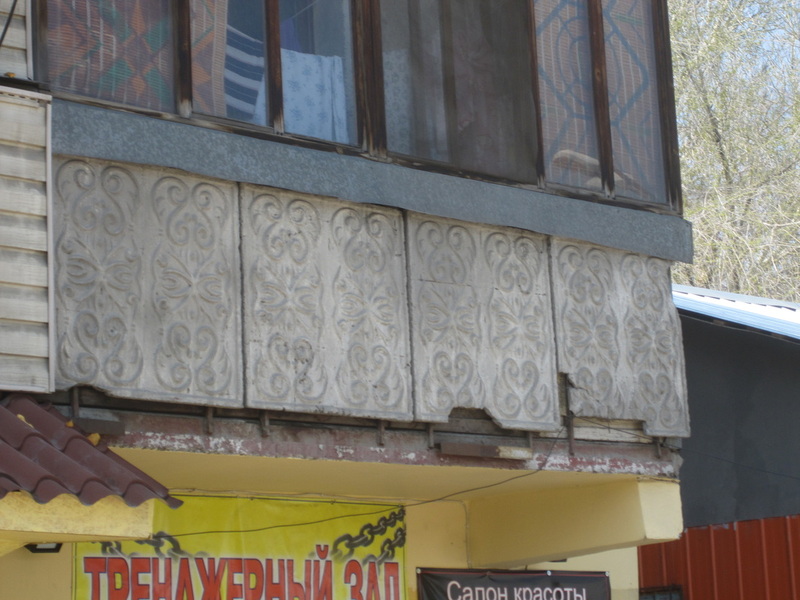 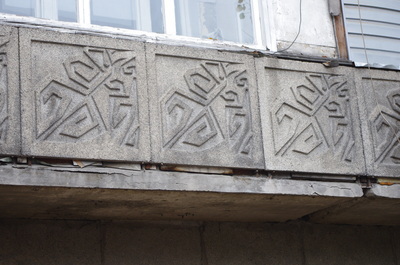 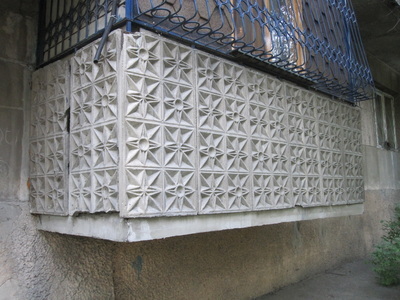 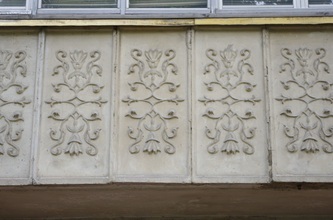 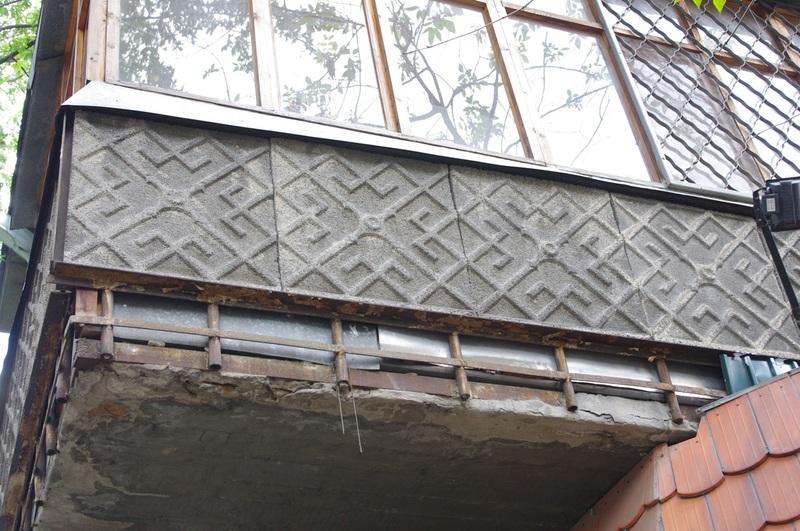 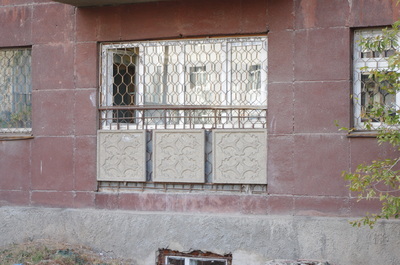 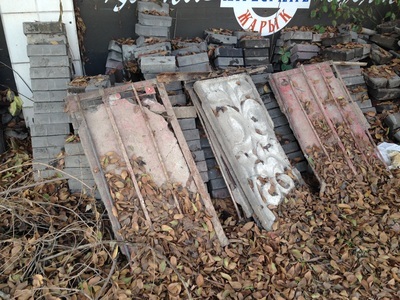 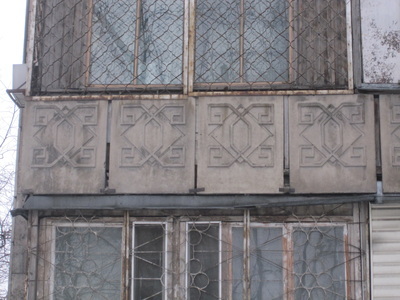 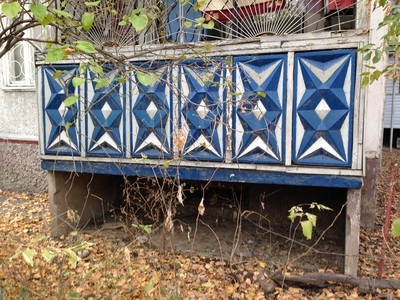 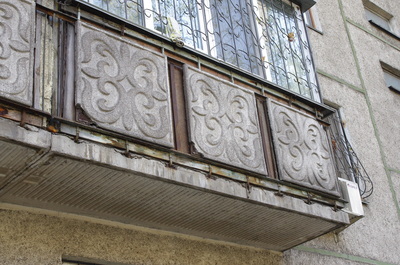 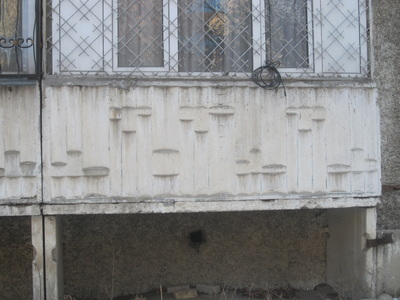 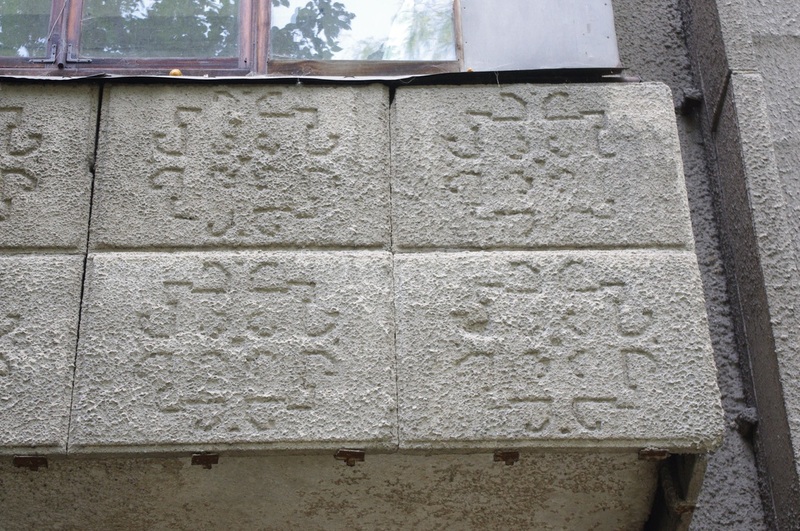 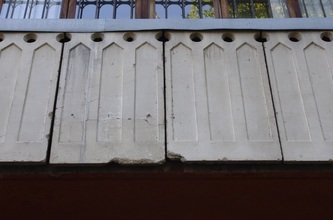 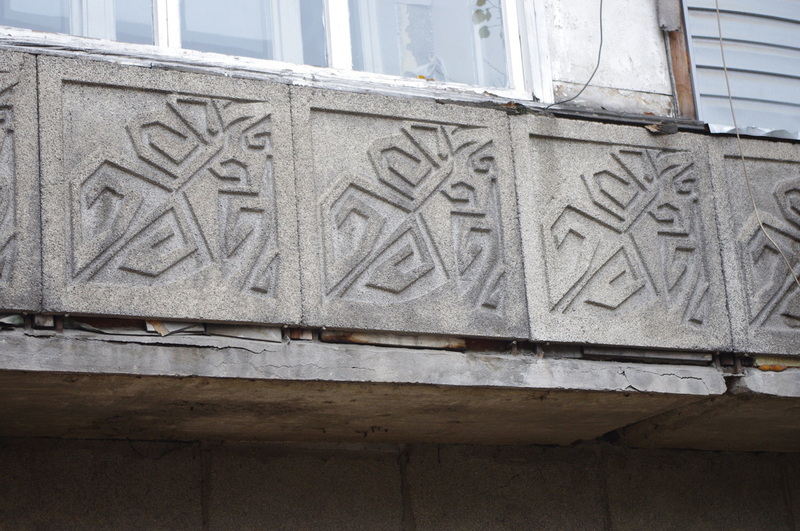 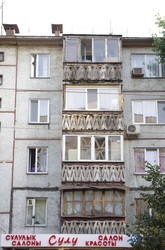 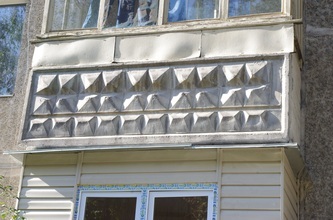 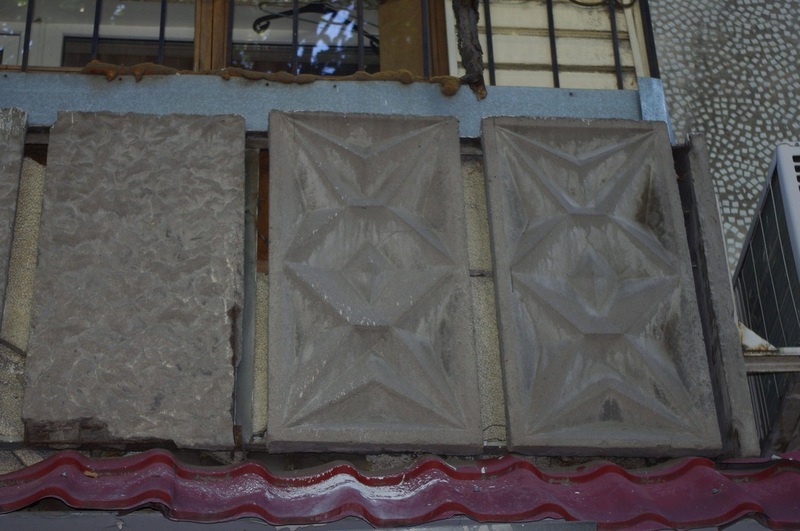 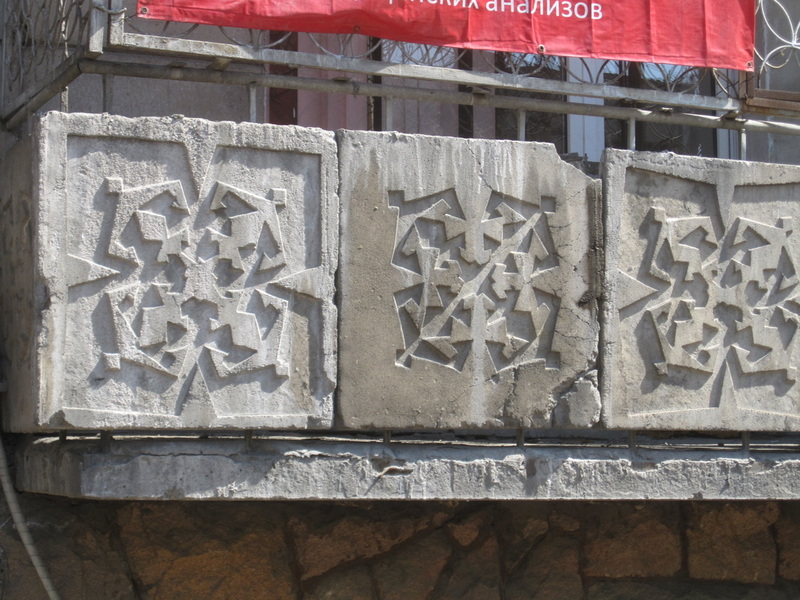 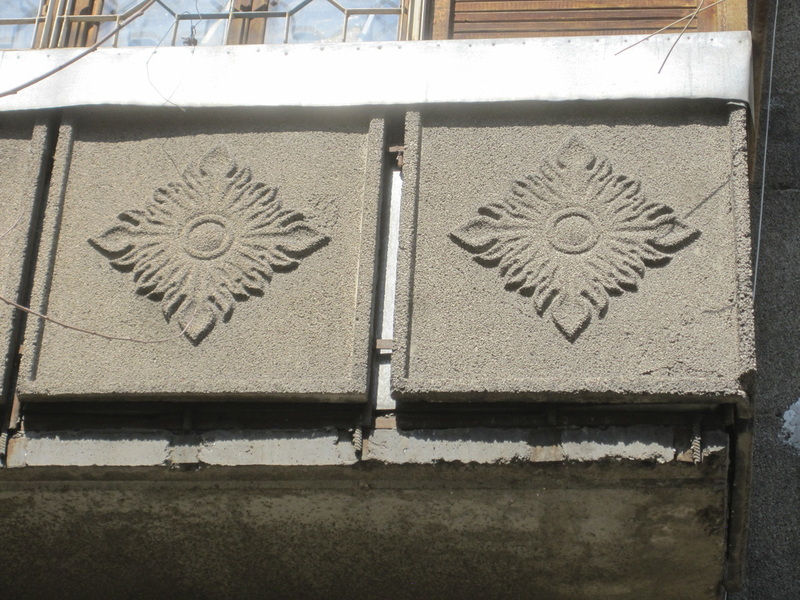 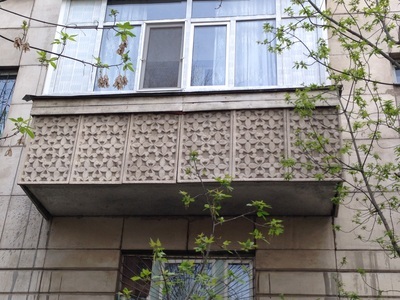 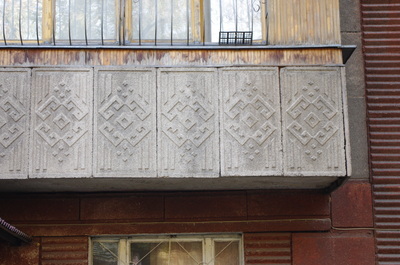 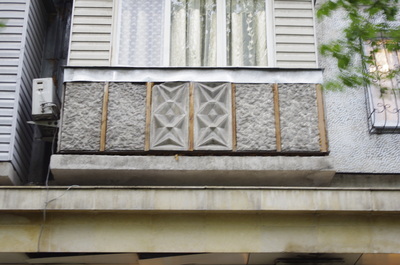 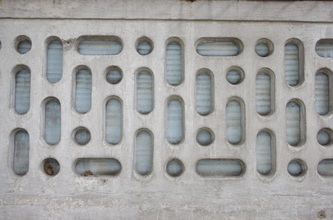 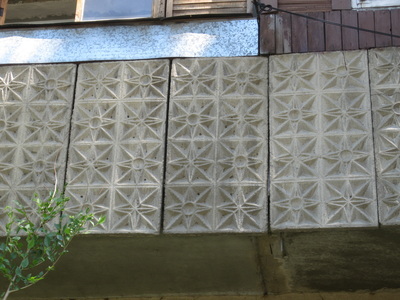 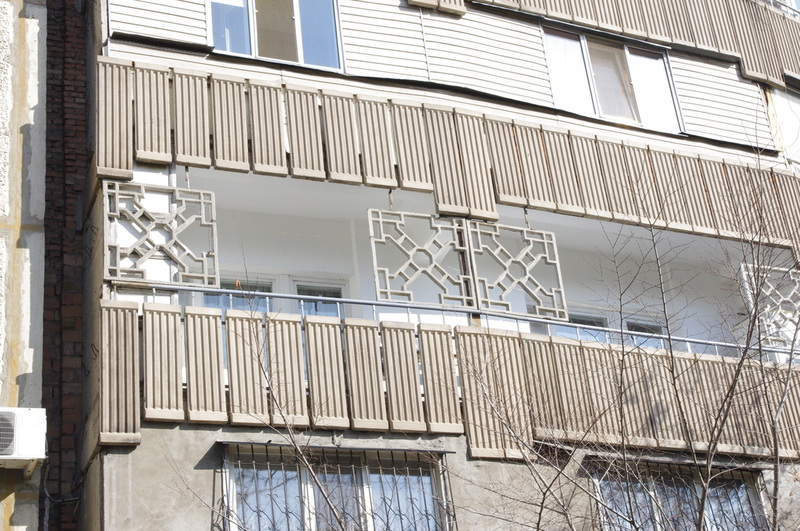 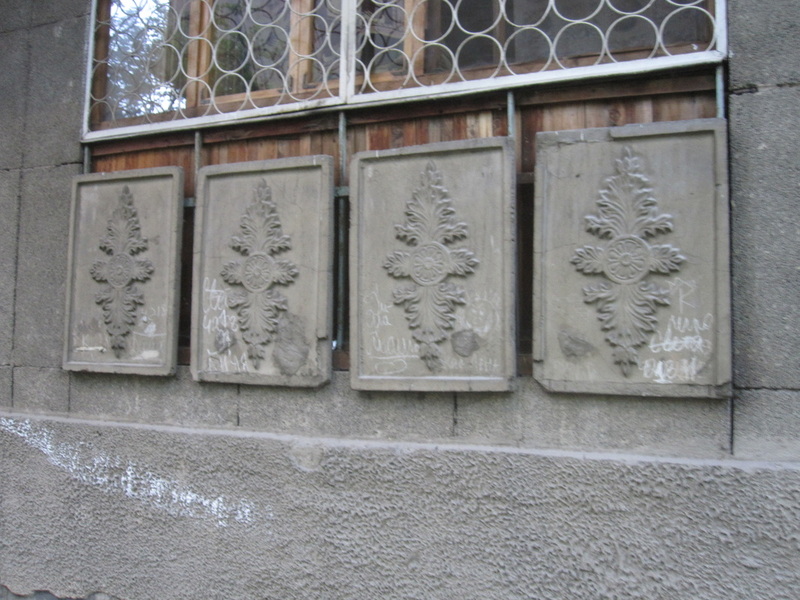 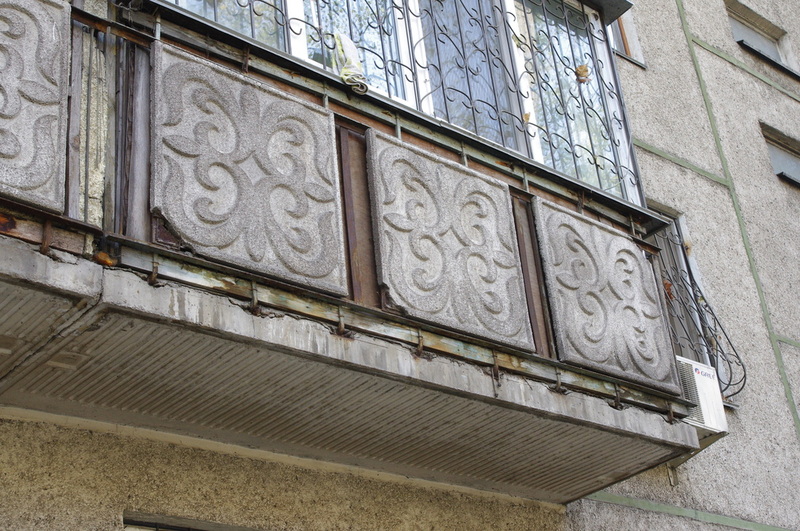 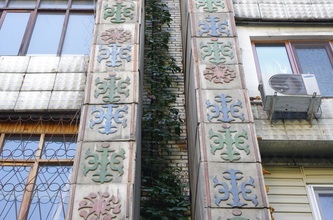 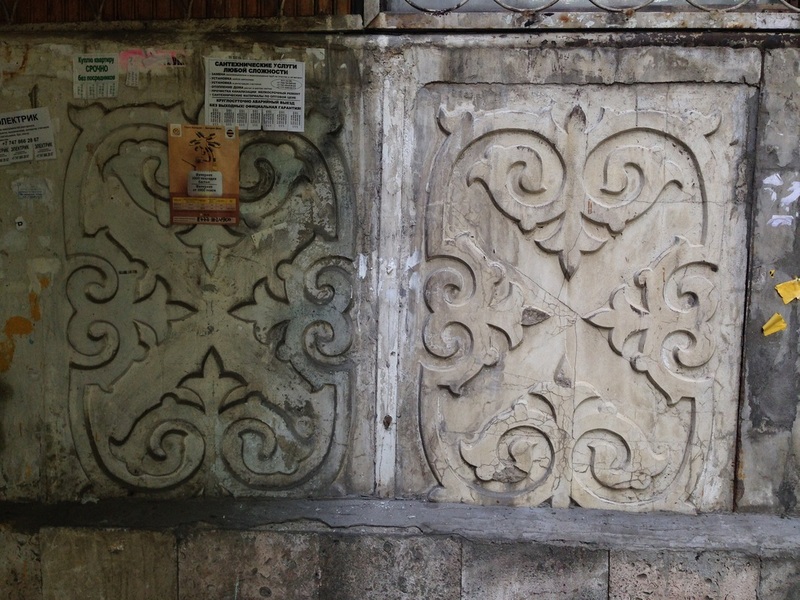 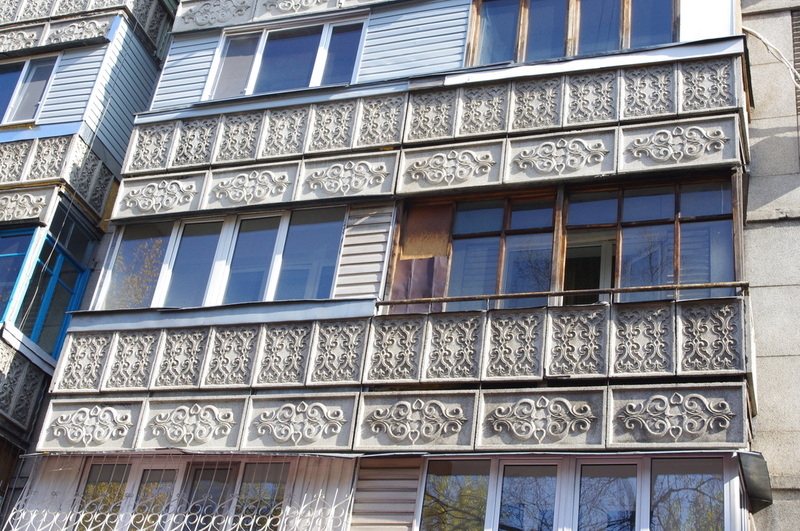 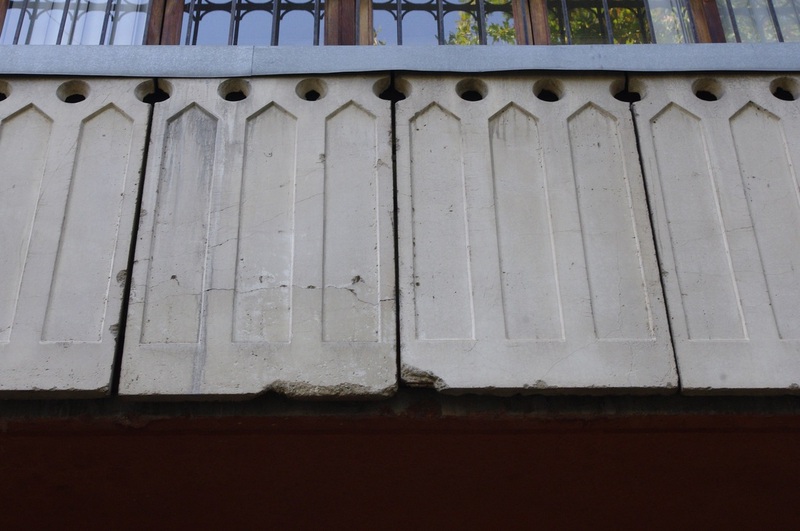 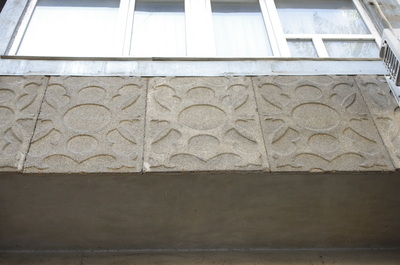 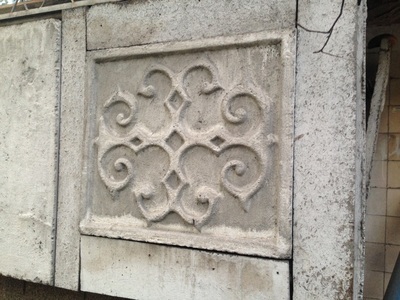 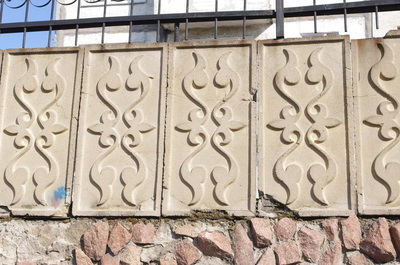 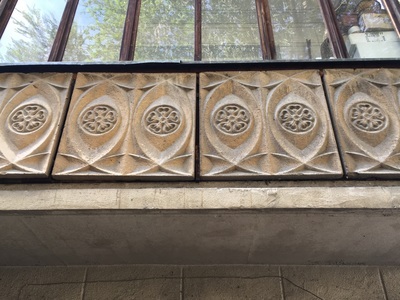 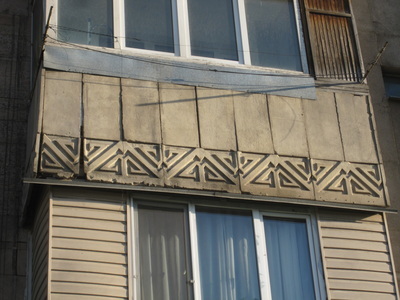 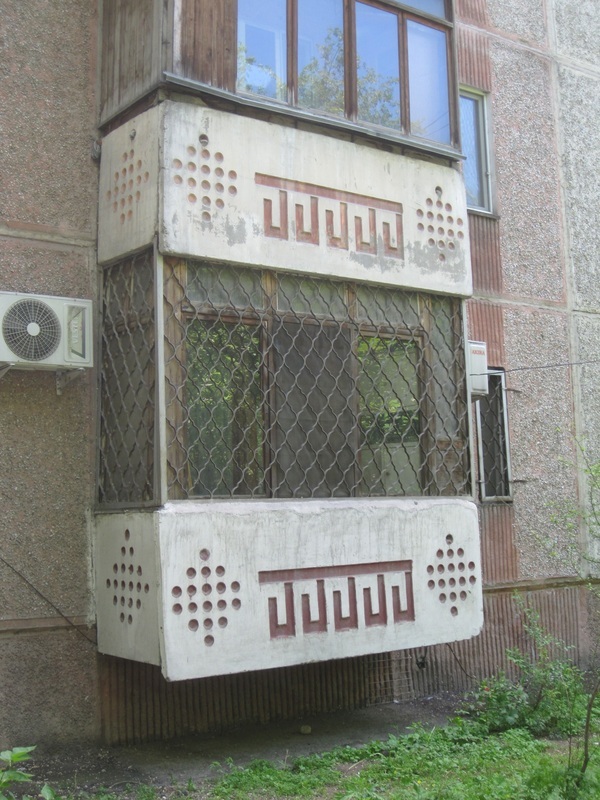 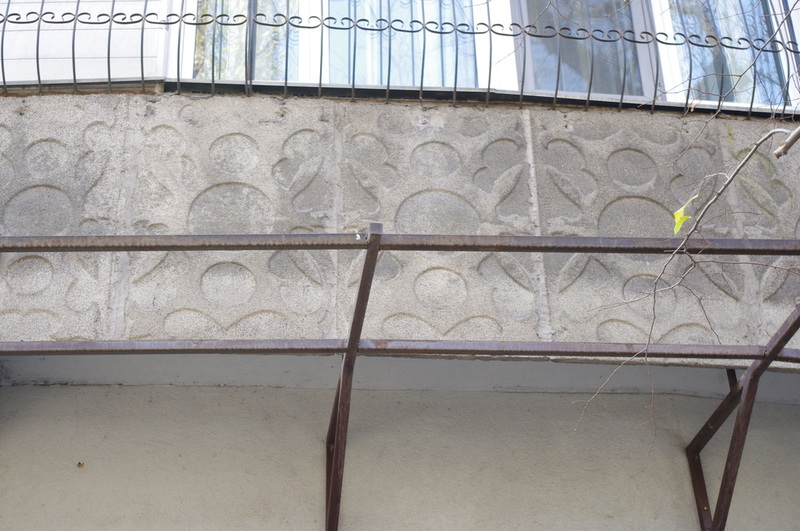 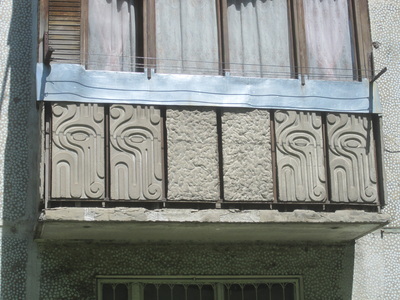 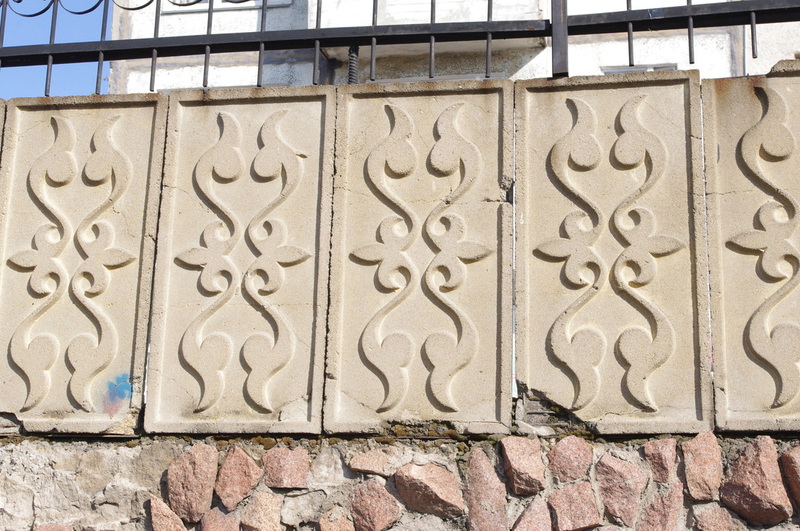 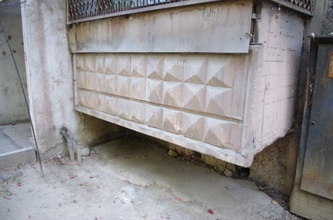 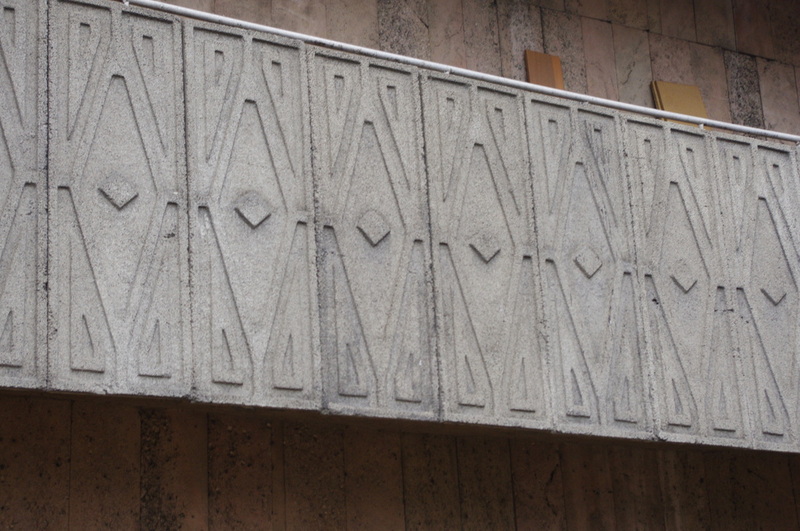 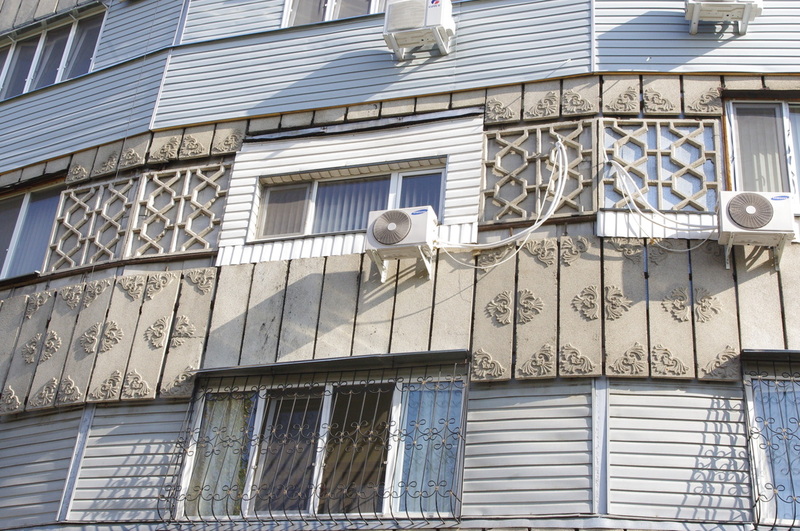 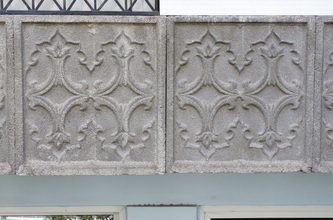 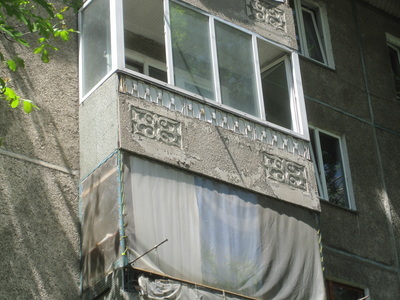 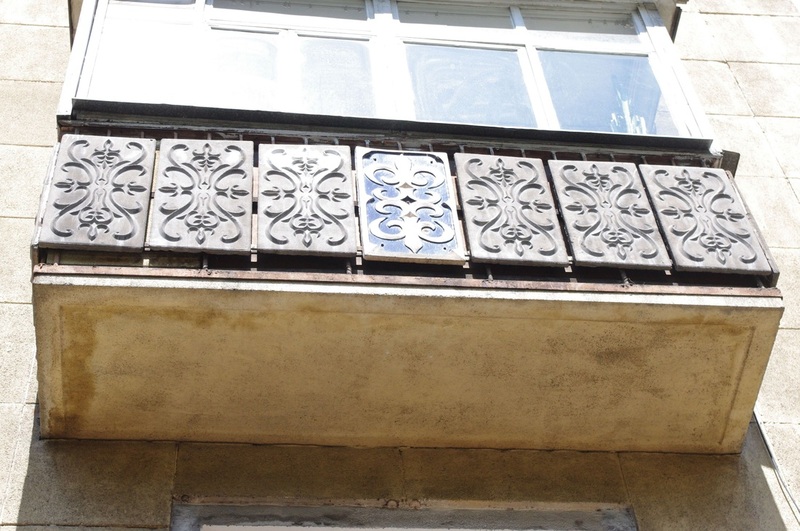 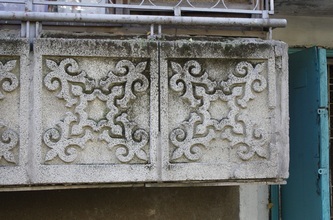 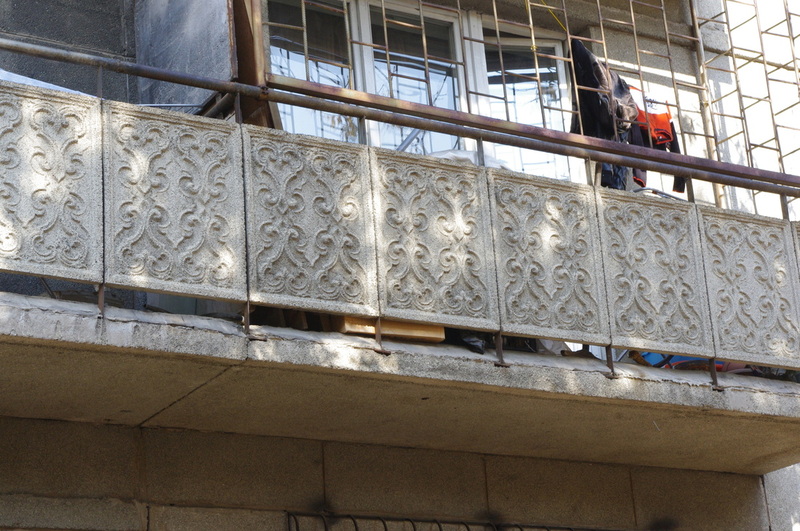 These balcony panels were made from dozens of different molds, making each building unique. 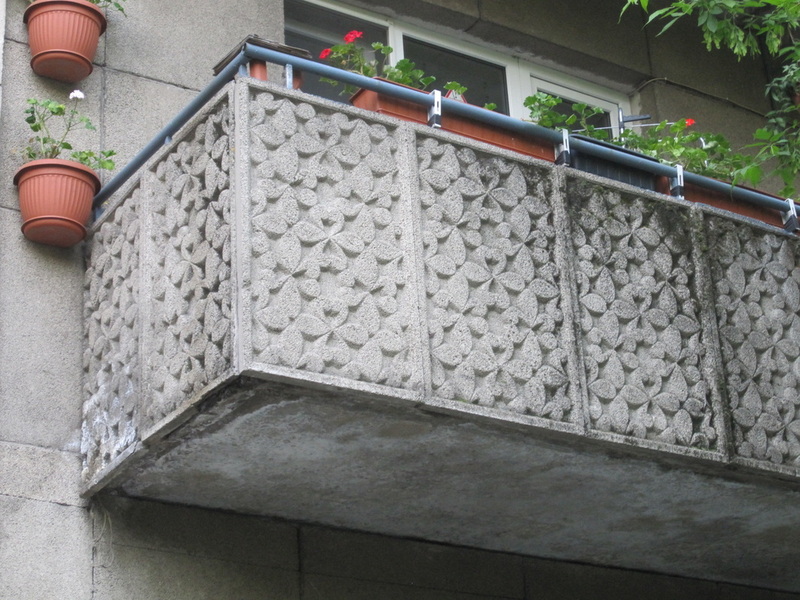 When you start to keep tabs on them, you realize that certain models were especially popular, appearing on housing projects all over town. 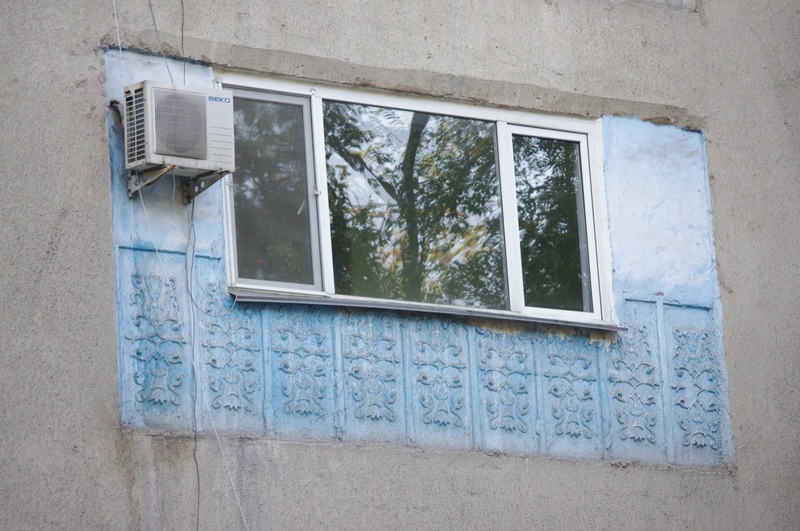 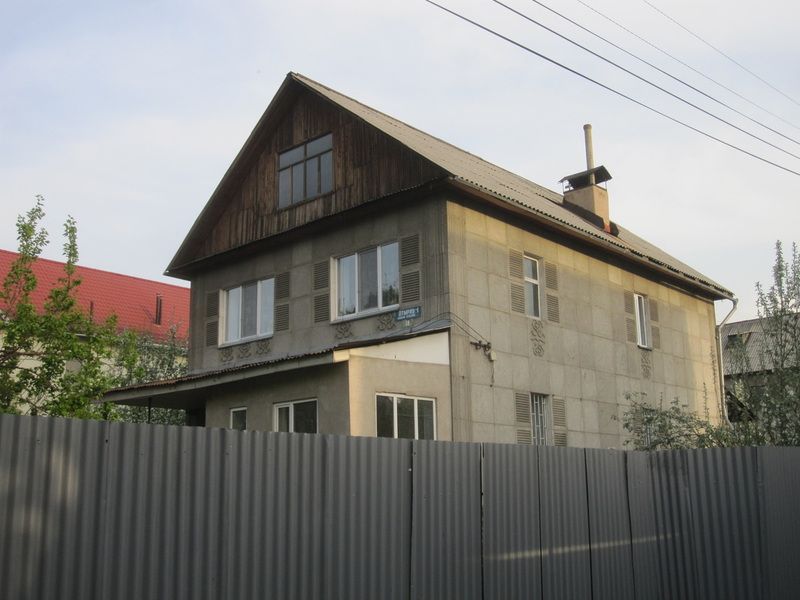 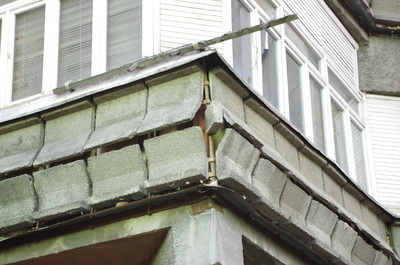 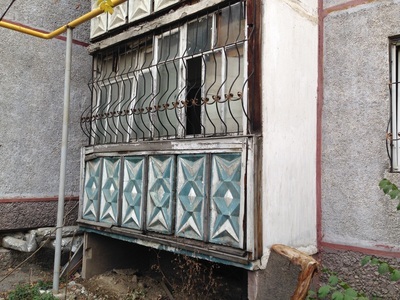 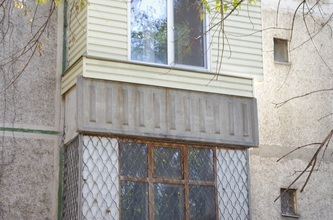 Most of the panels were made in the Almaty Homebuilding Factory, and it seems that some had longer production runs than others. 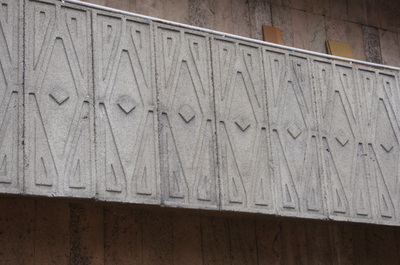 There might have even been a surplus of some designs, as I've seen the same balcony panels from 9-story towers turn up in the architecture of private homes. 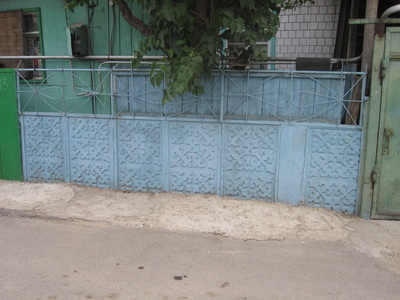 They've also been adapted for flowerpots and little aryk crossings. 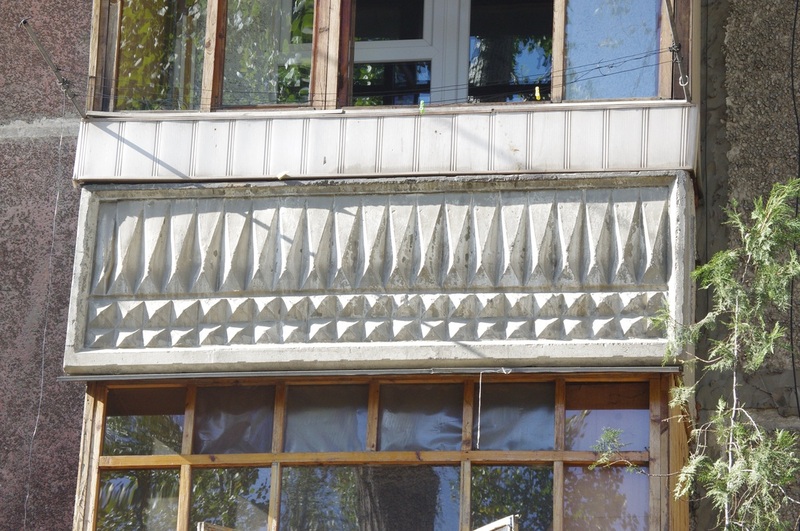 I wrote something similar about brise soleil, but I think these panels, as insignificant as they may seem to the average Almatian, are the key to understanding local mass architecture. 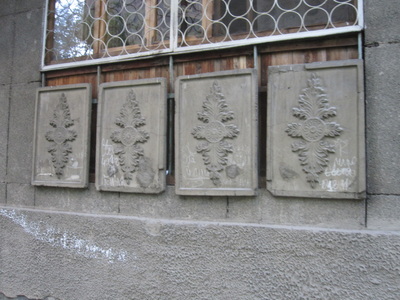 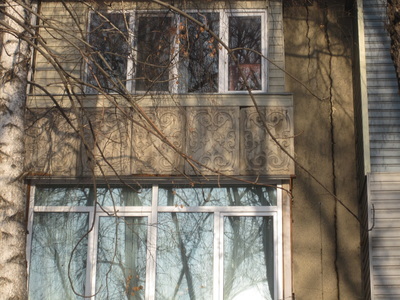 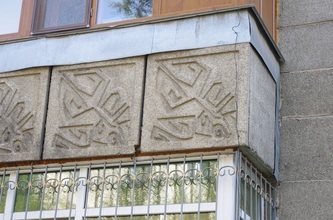 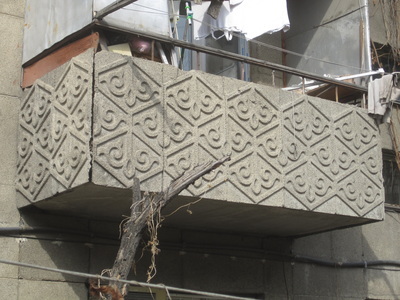 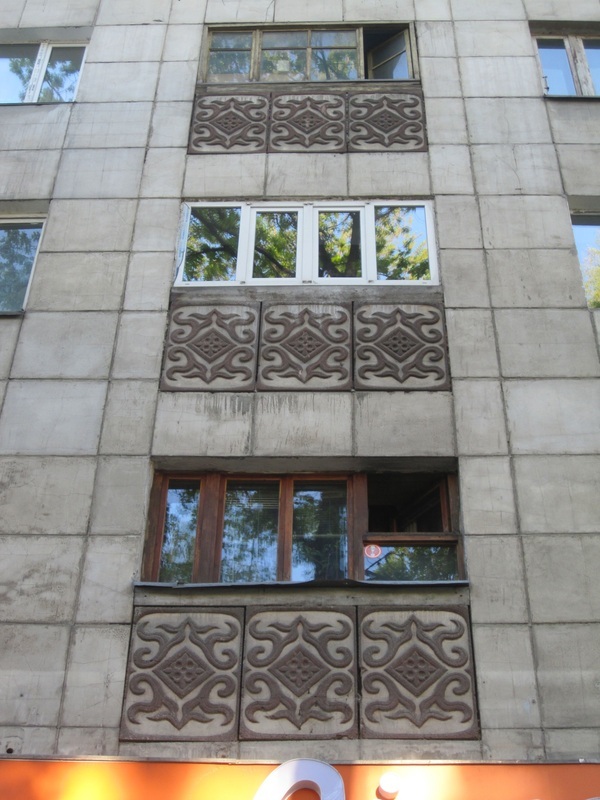 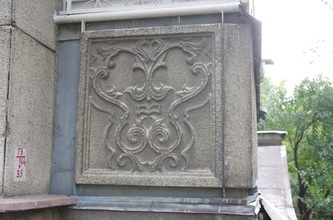 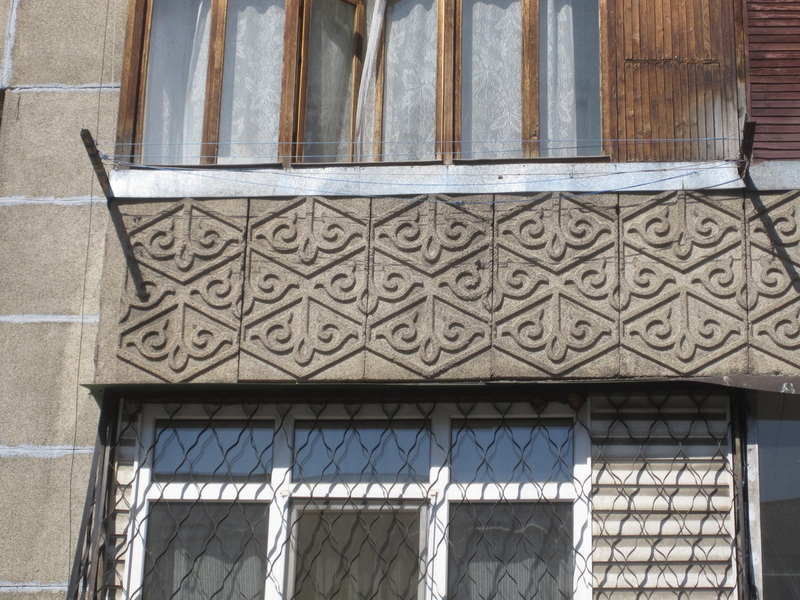 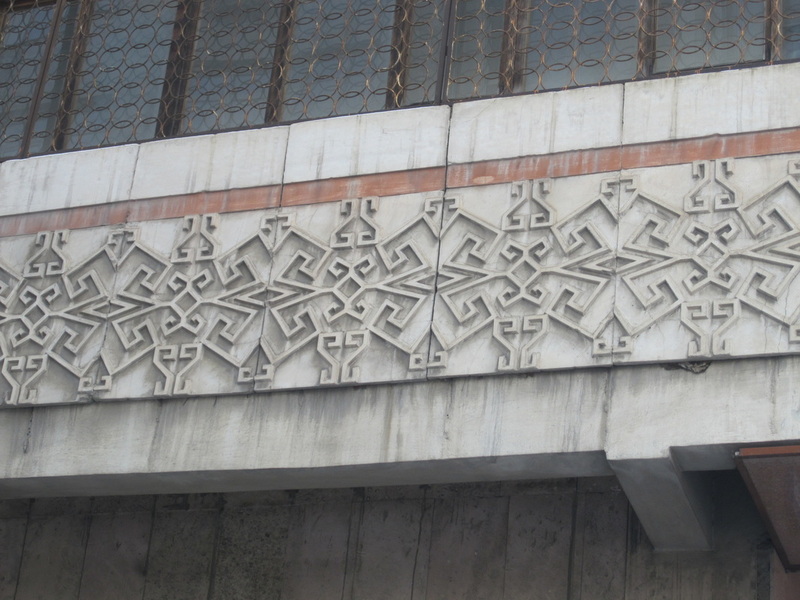 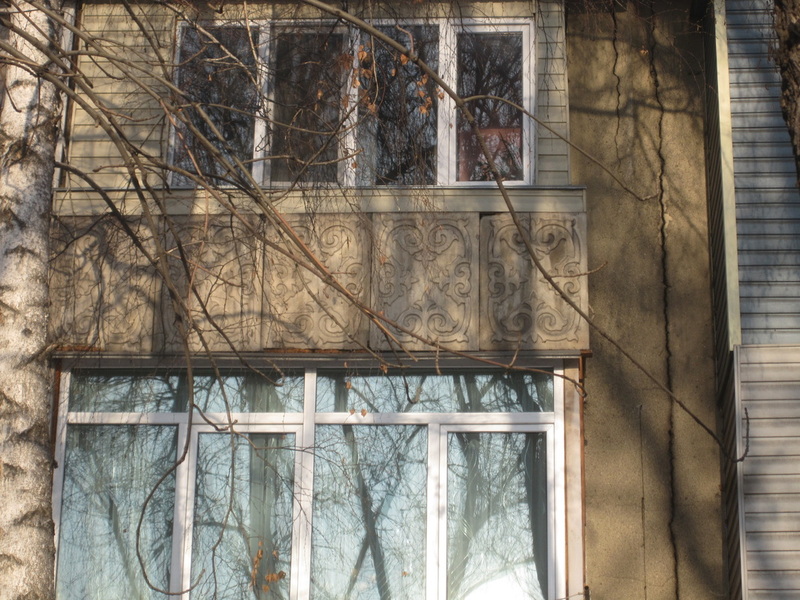 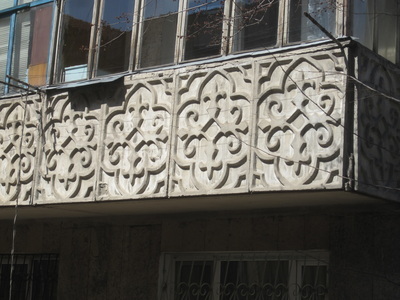 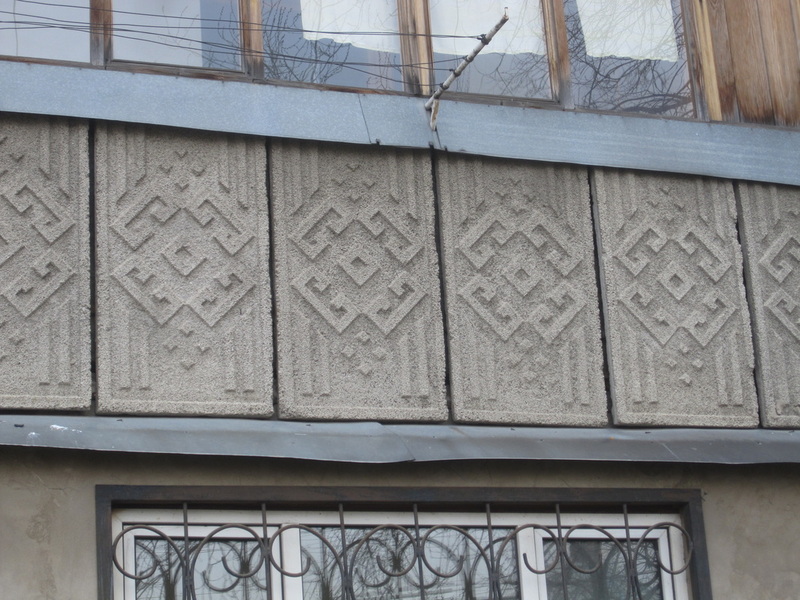 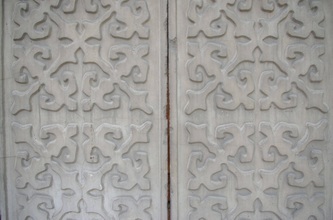 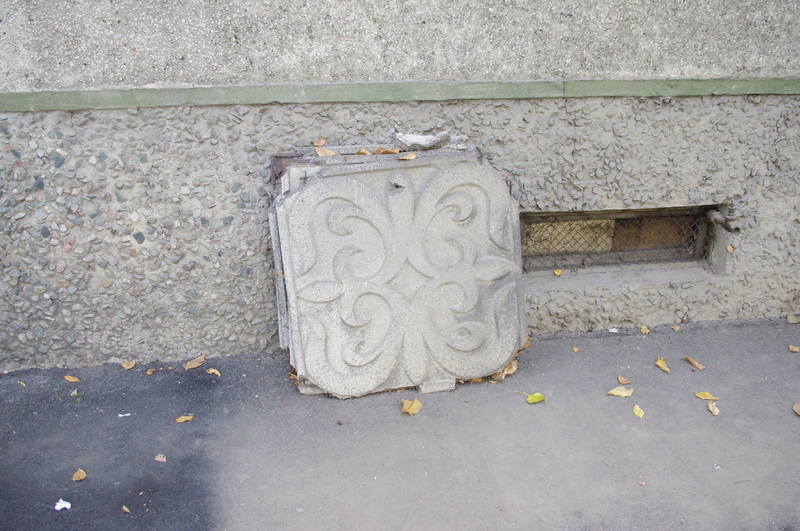 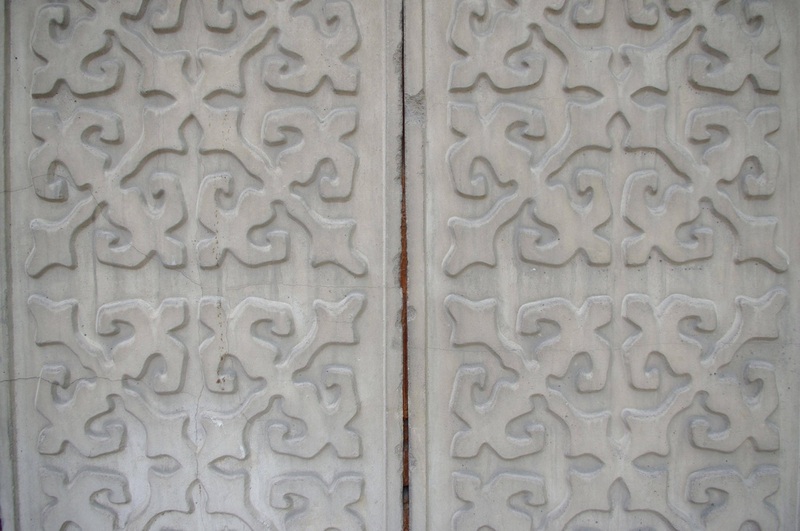 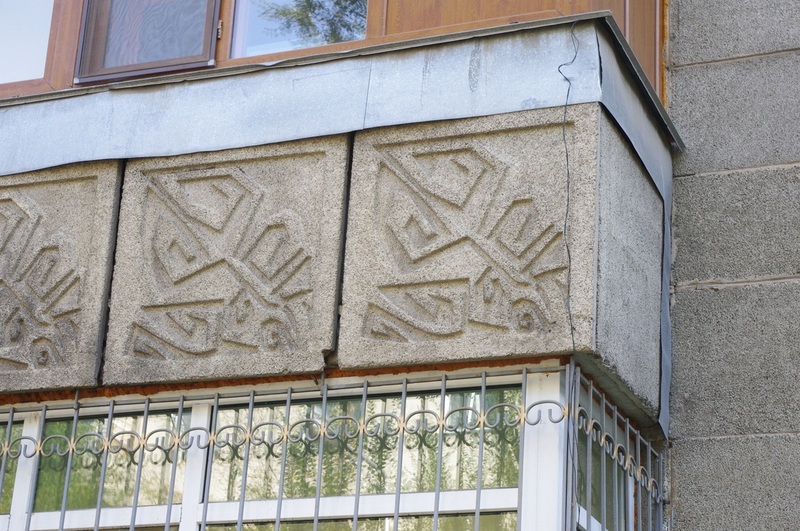 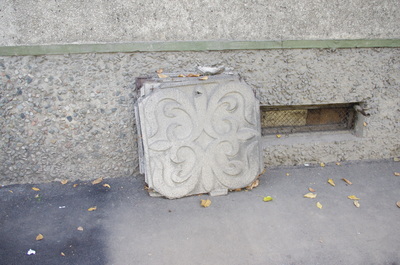 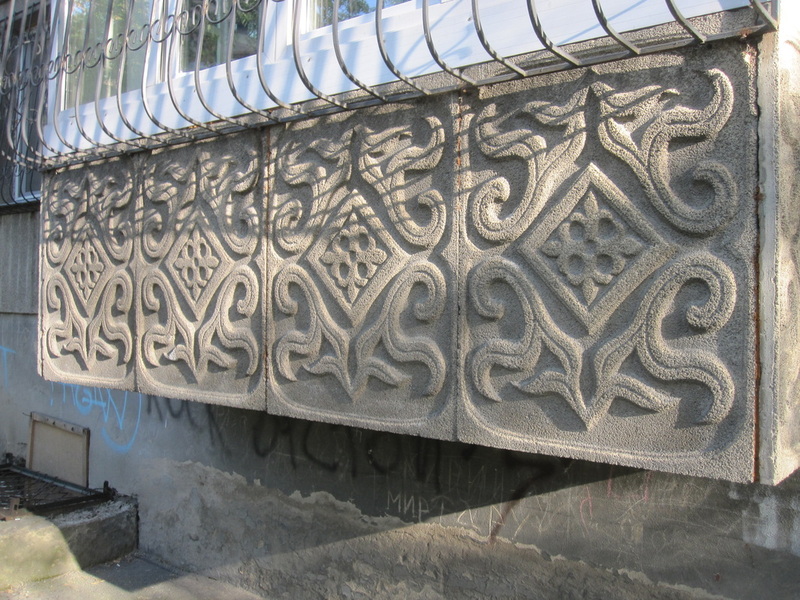 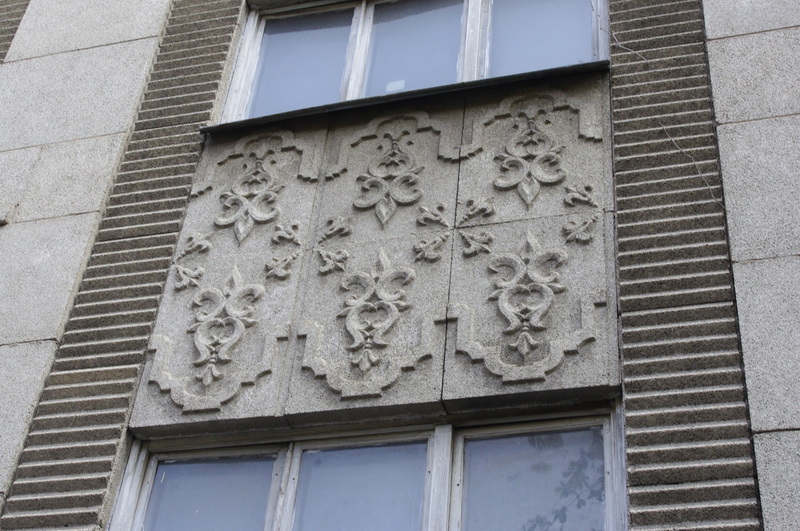 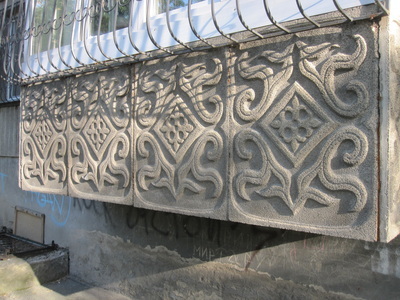 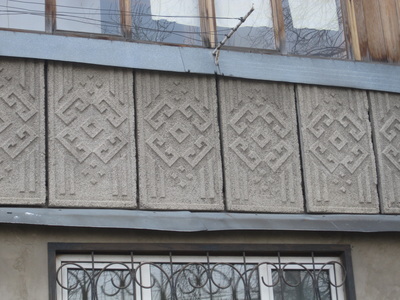 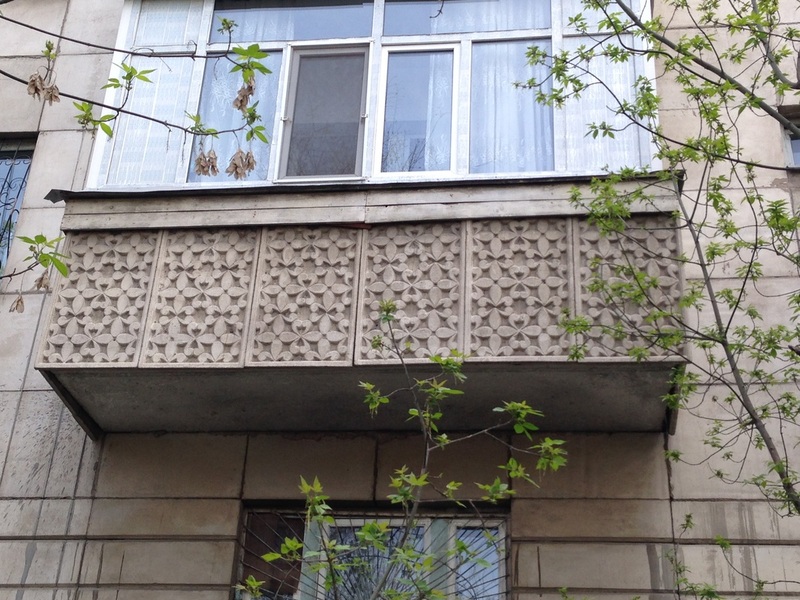 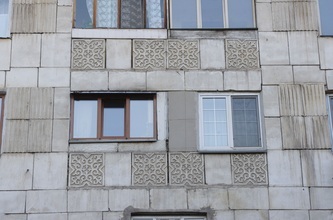 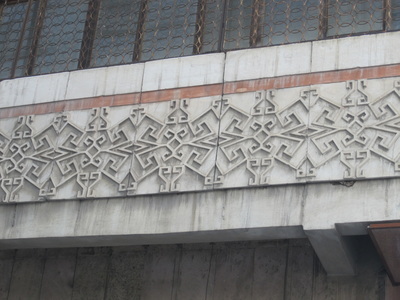 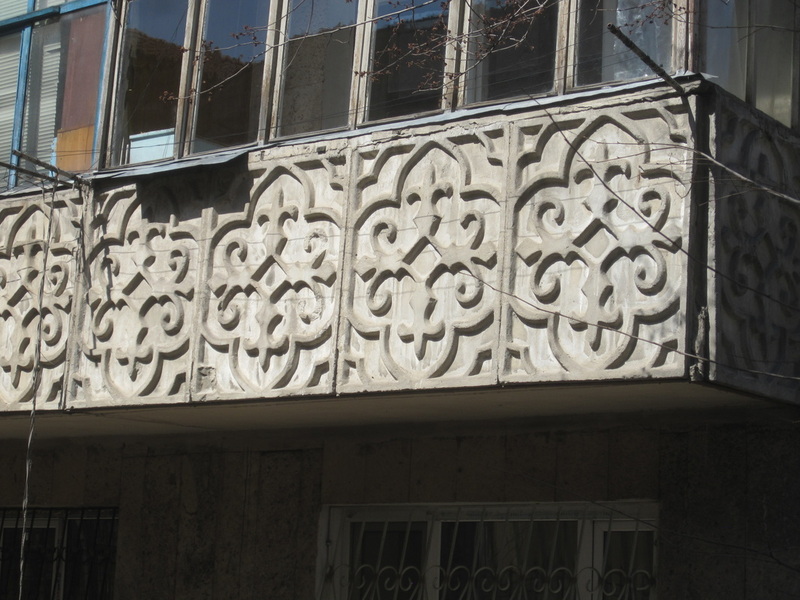 The panels' symmetric designs, often taken from the rich world of Kazakh ornamentation, were the only real way to distinguish any one building from another. Modernist building plans needed something to ground them in the local, and balcony panels were a convenient medium. 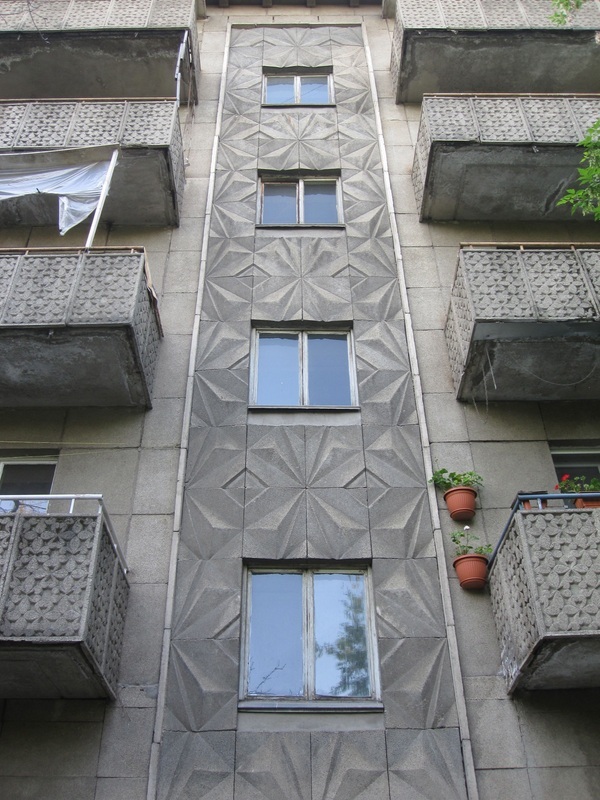 There was a Stalinist slogan that went "Socialist in content but national in form." Stalin himself may not have anticipated it, but these architectural ingredients became a major articulation of his vision.